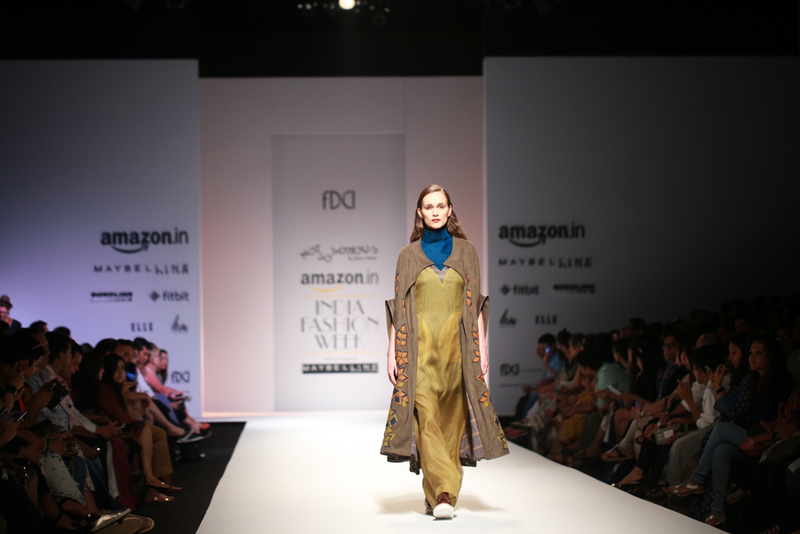 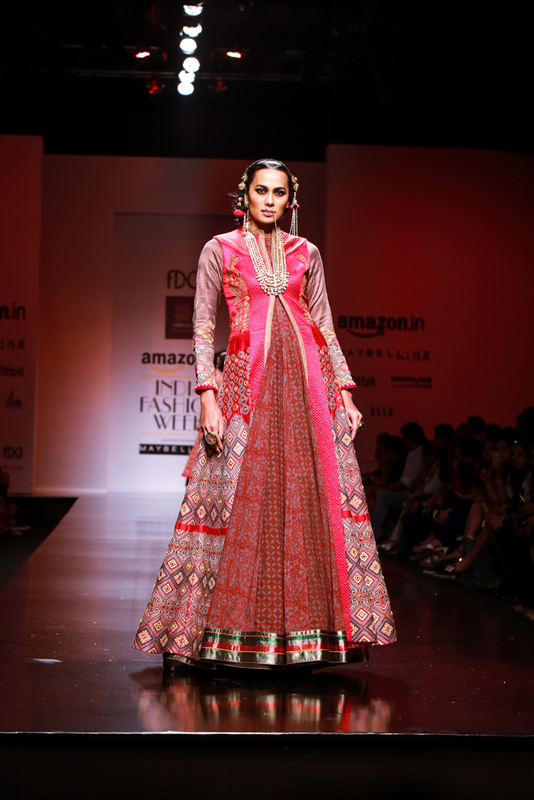 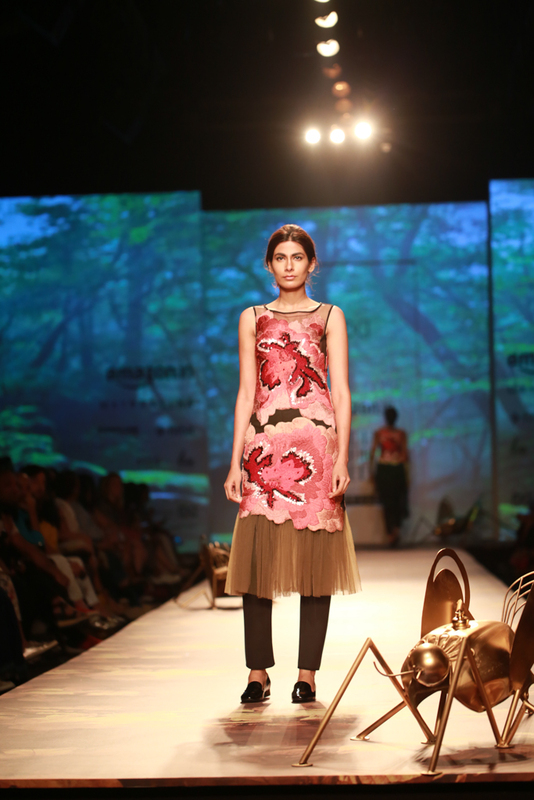 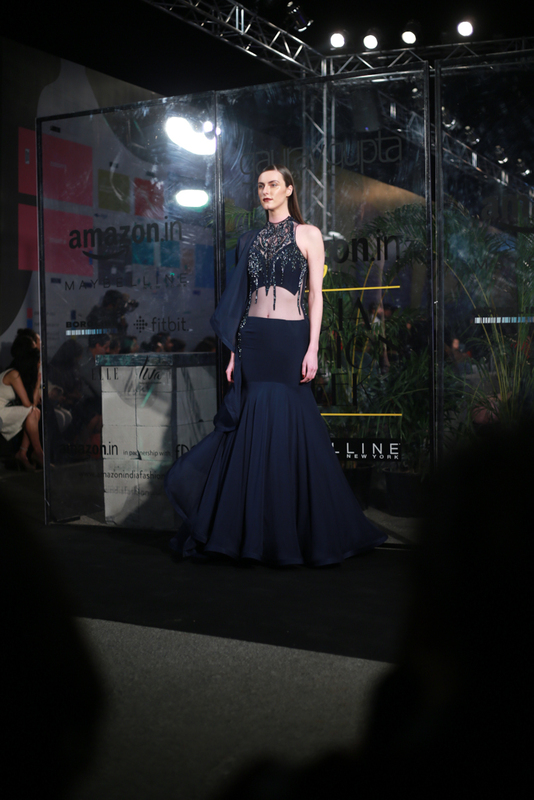 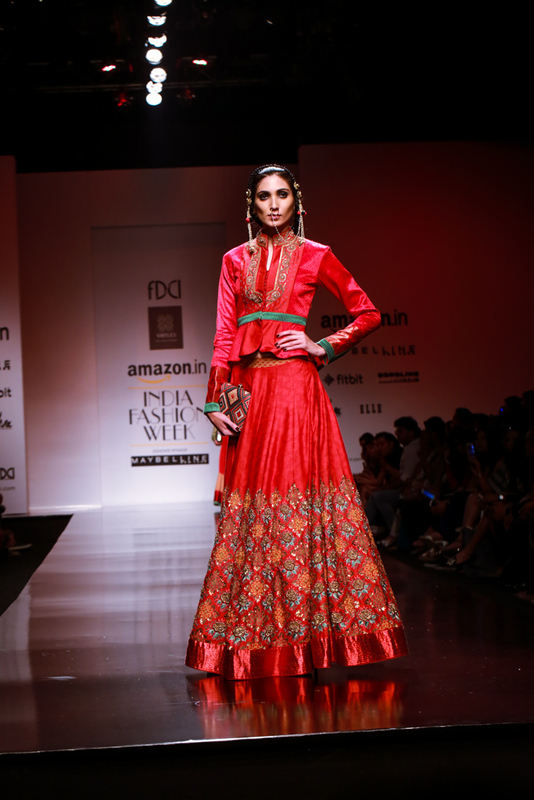 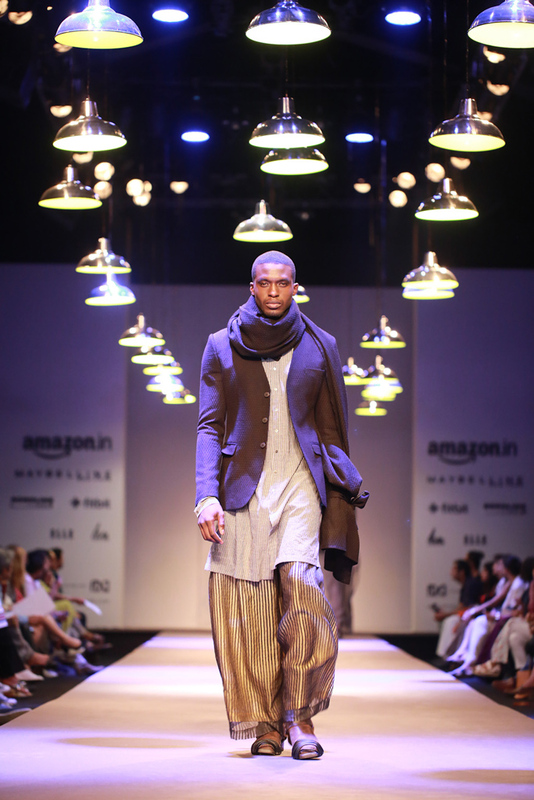 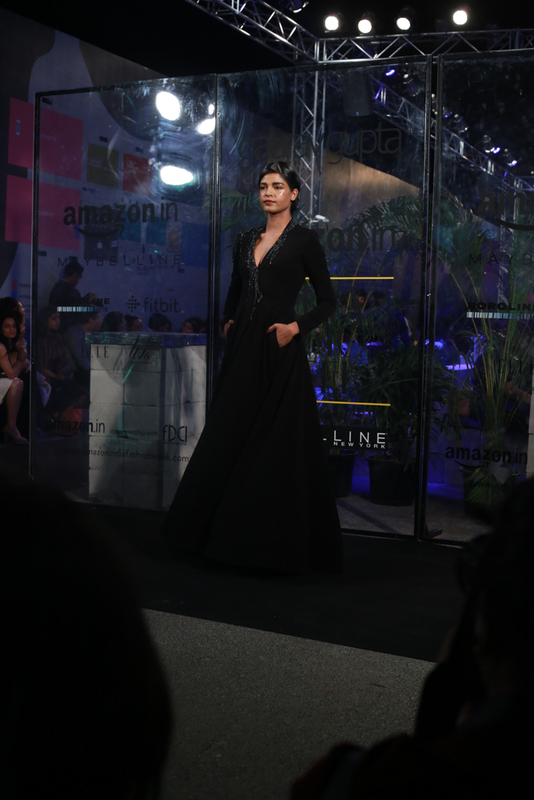 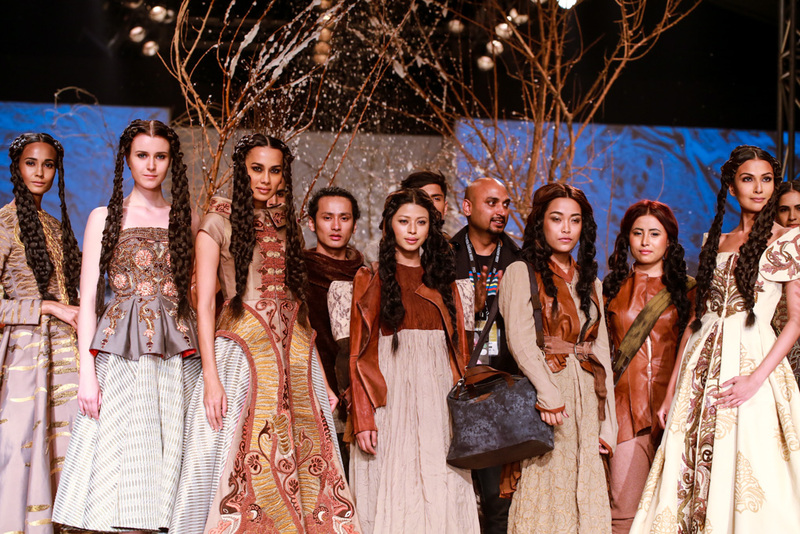 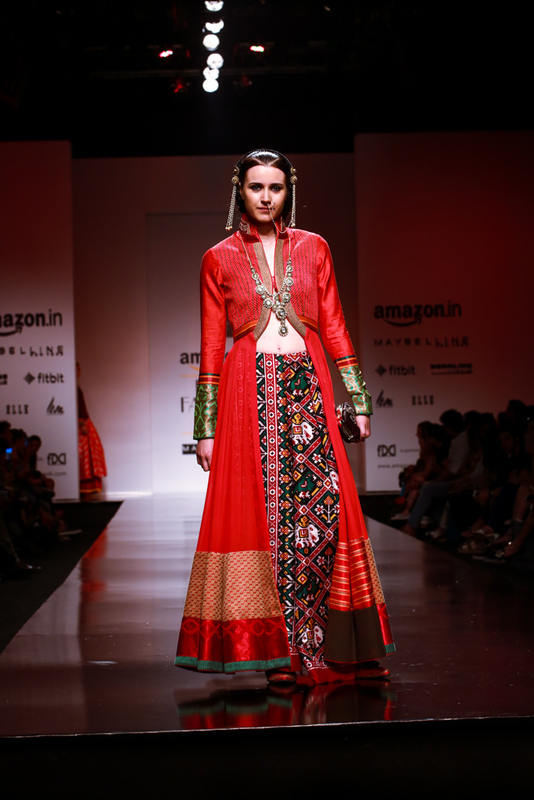 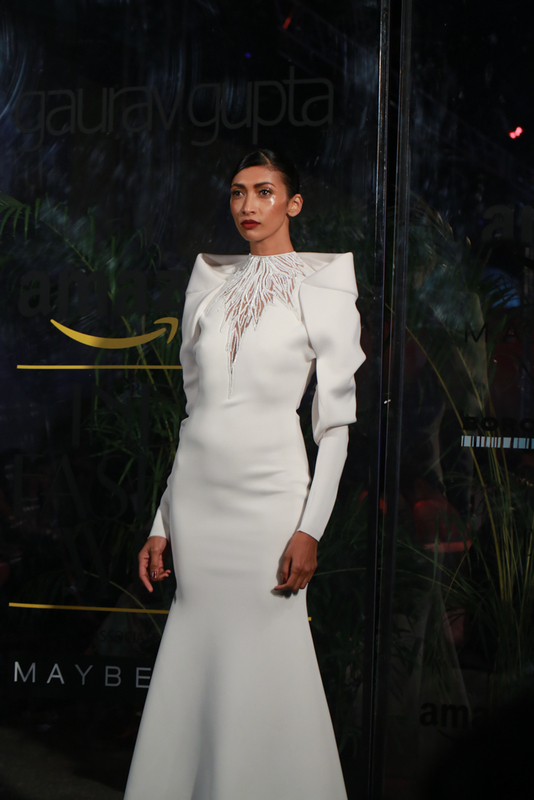 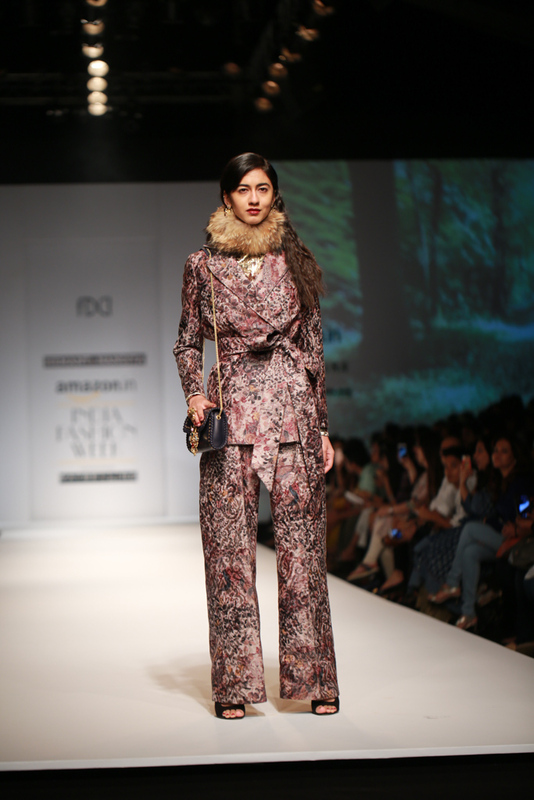 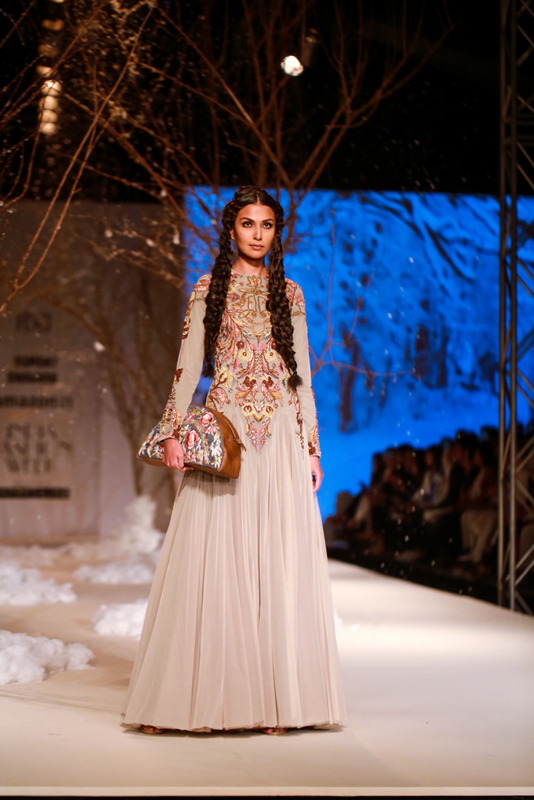 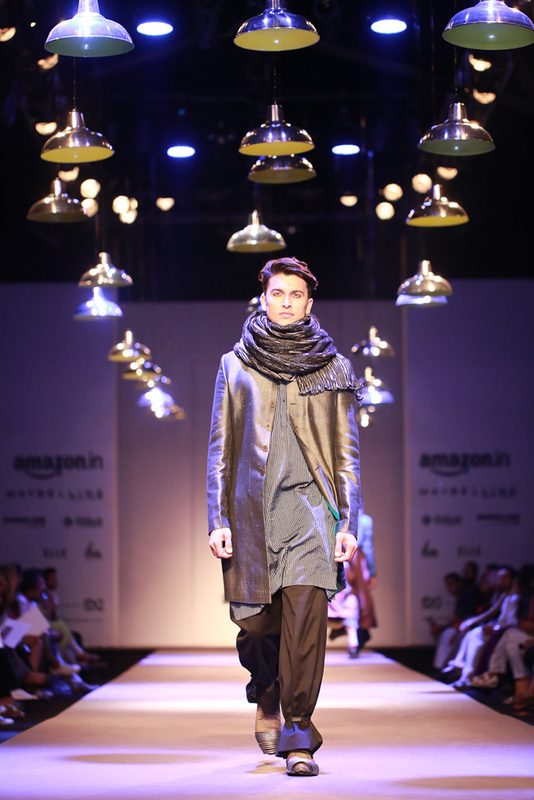 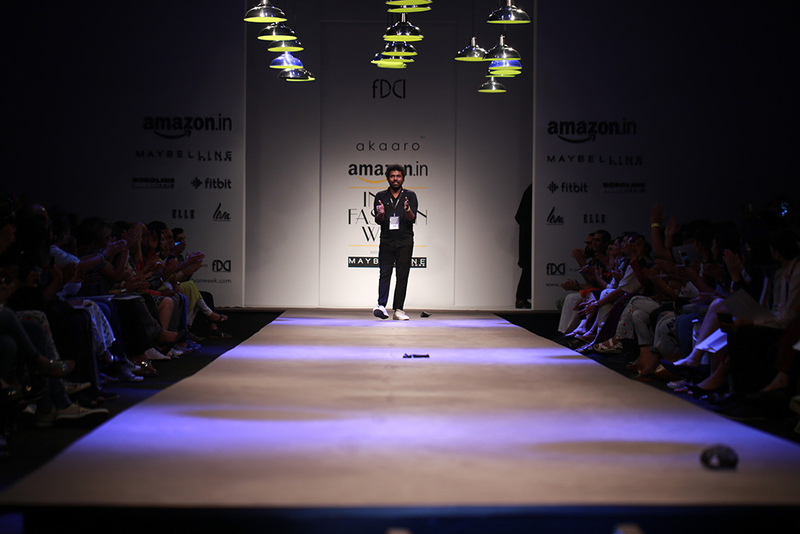 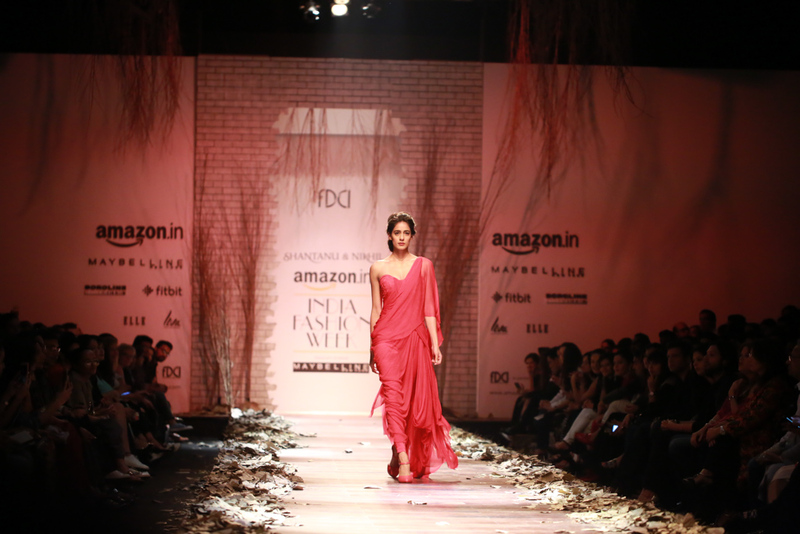 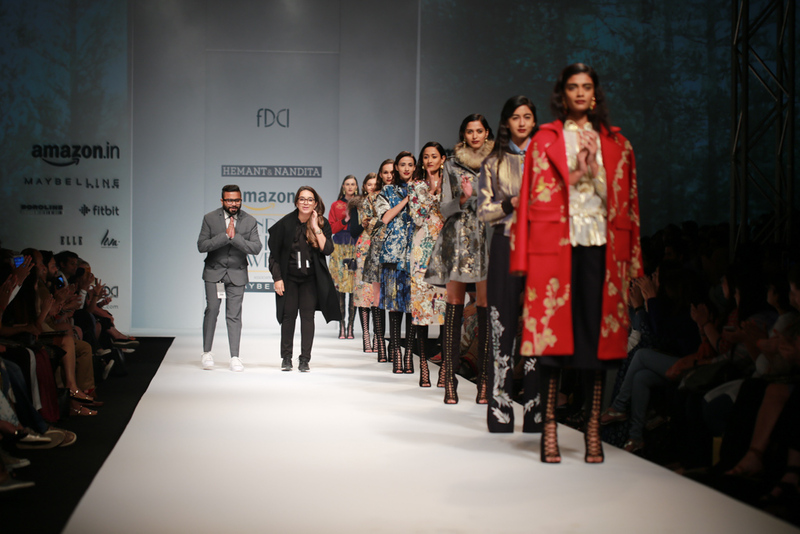 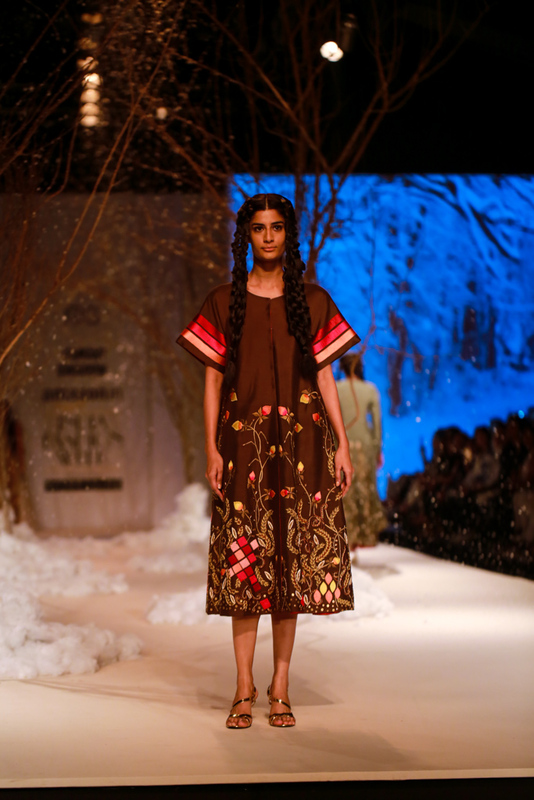 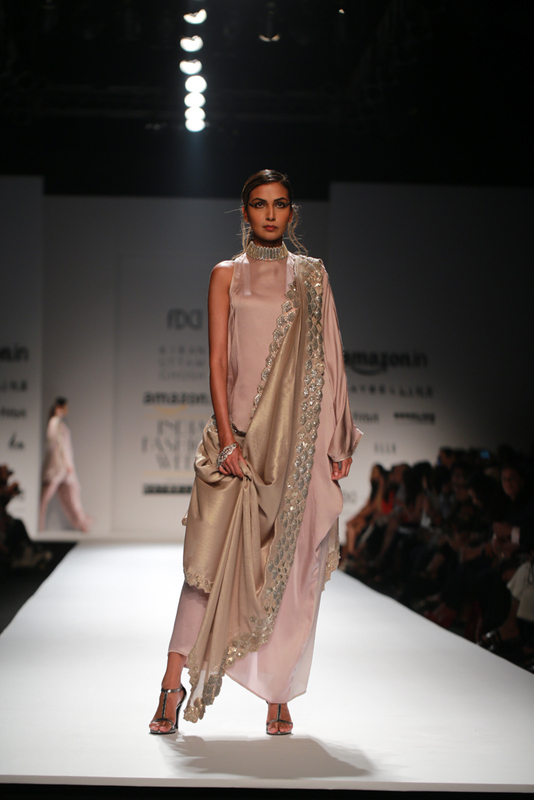 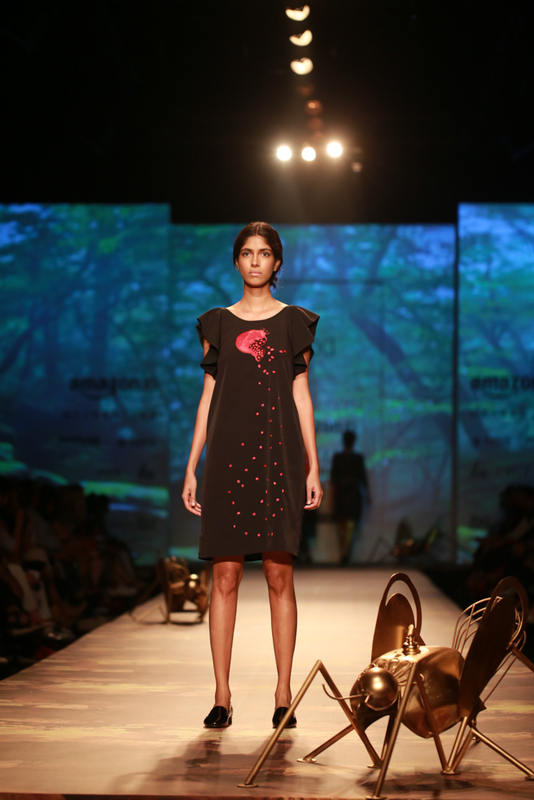 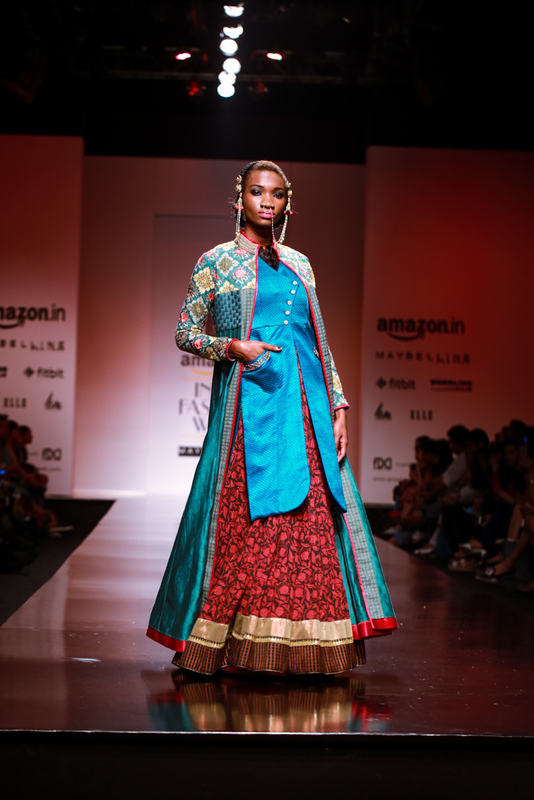 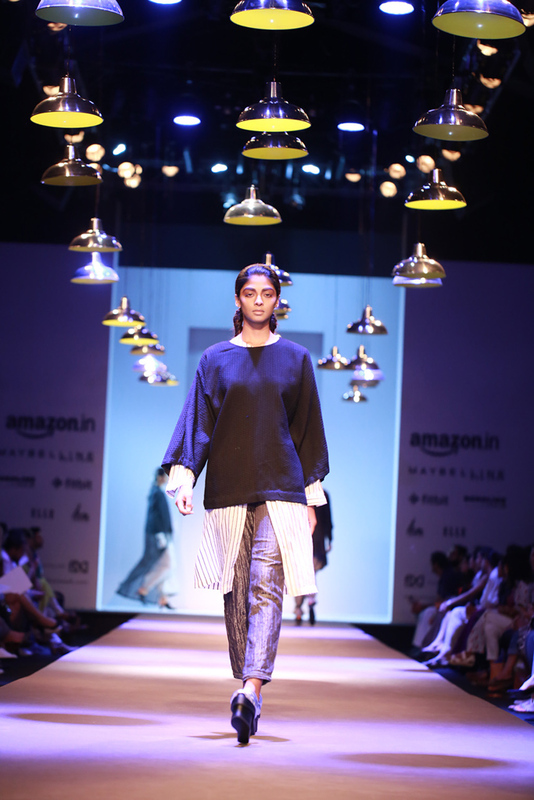 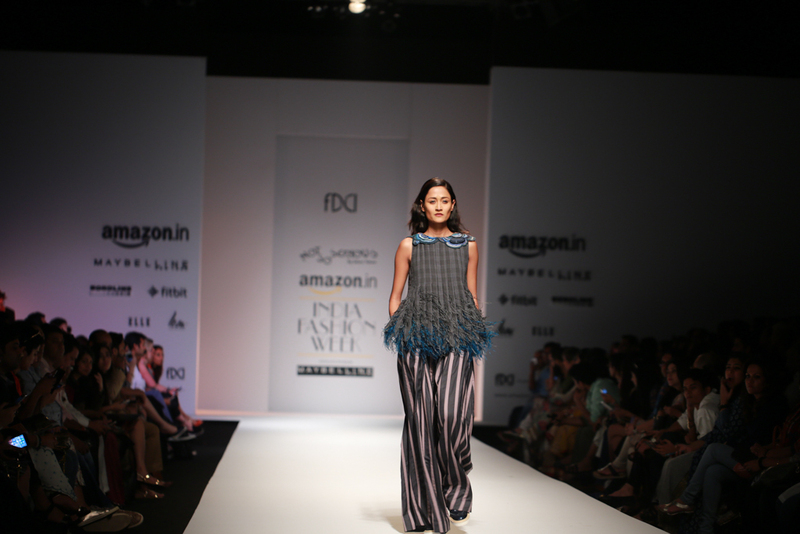 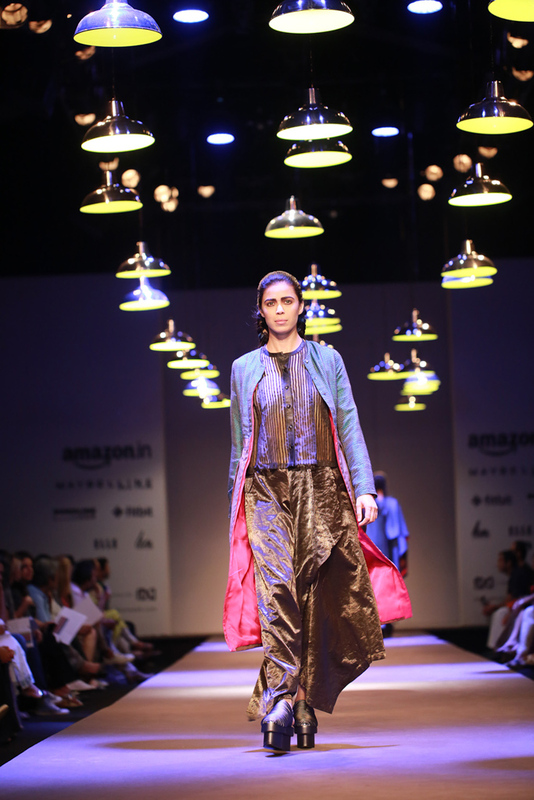 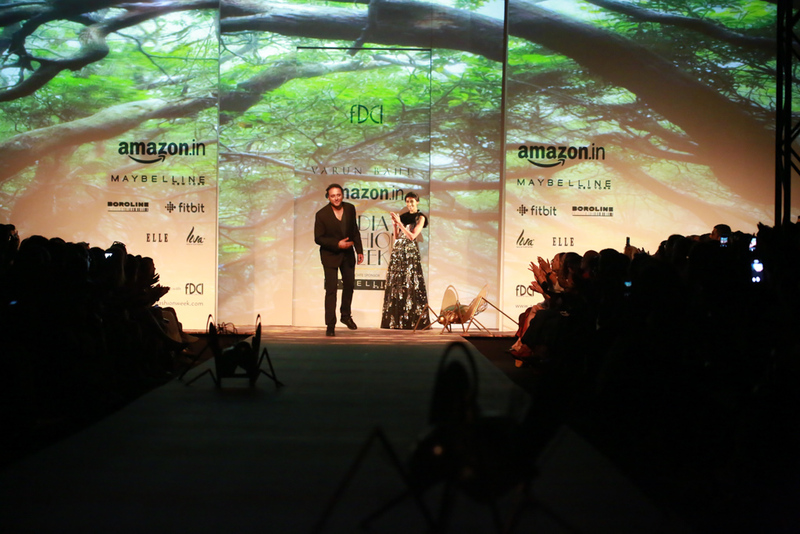 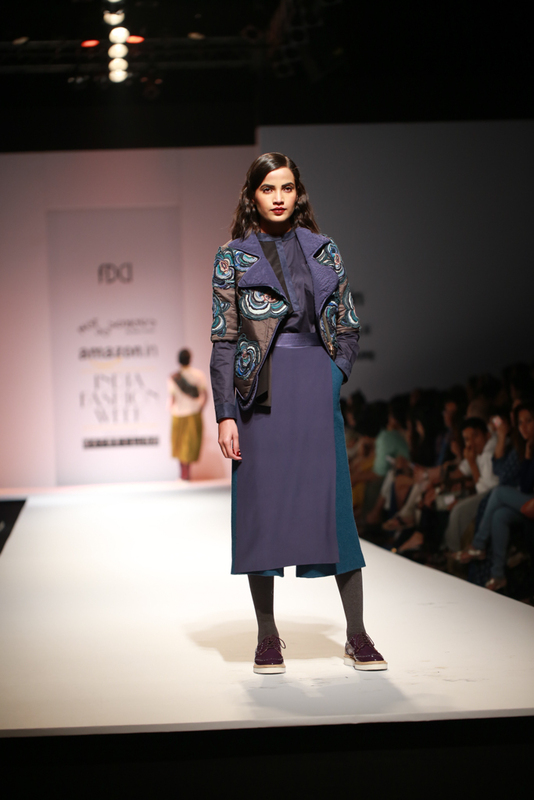 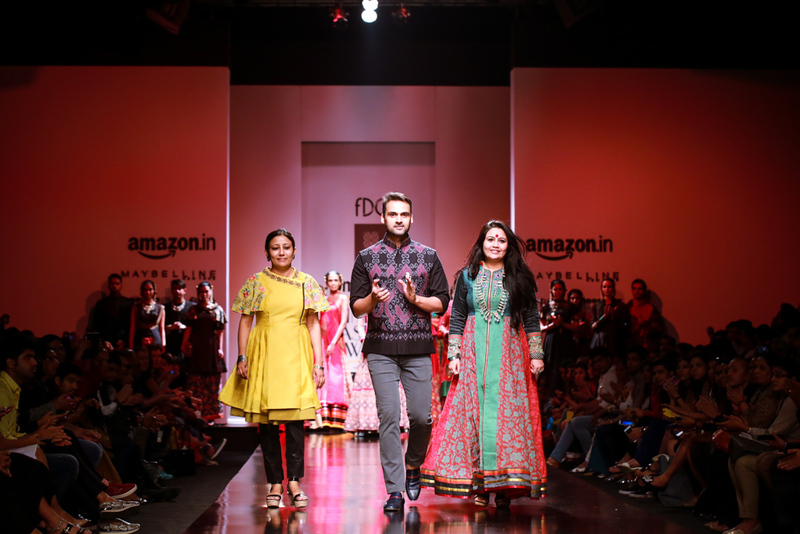 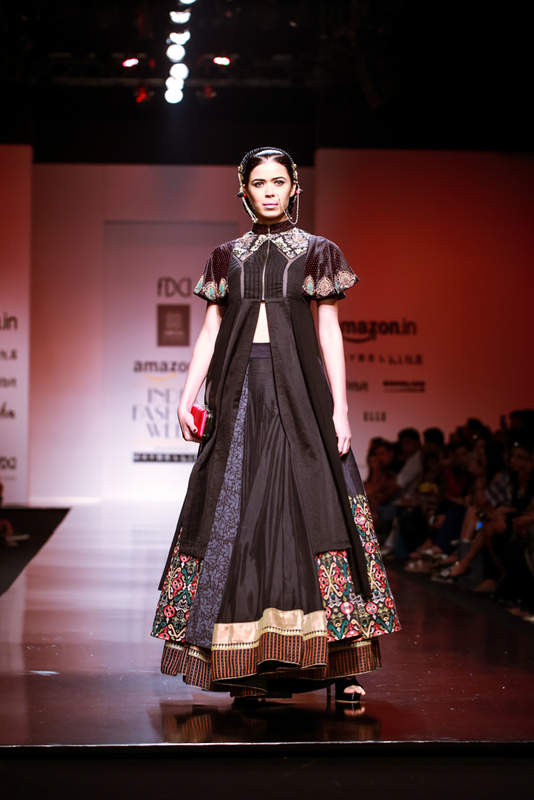 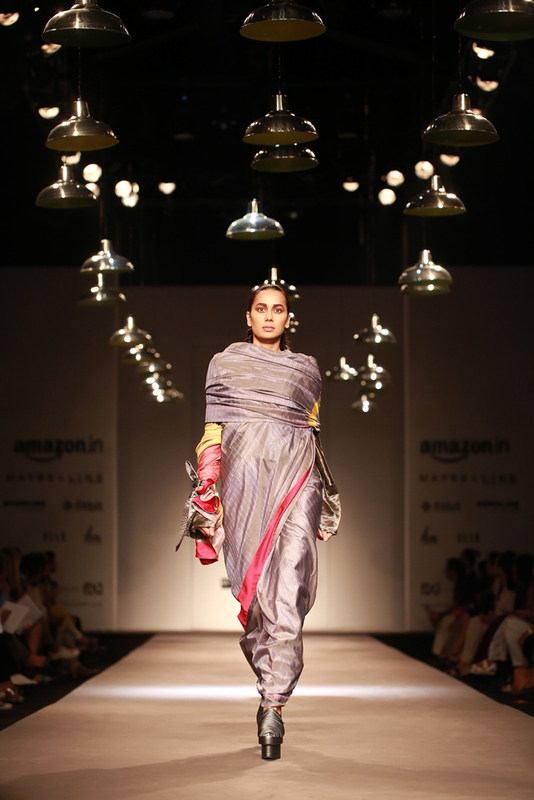 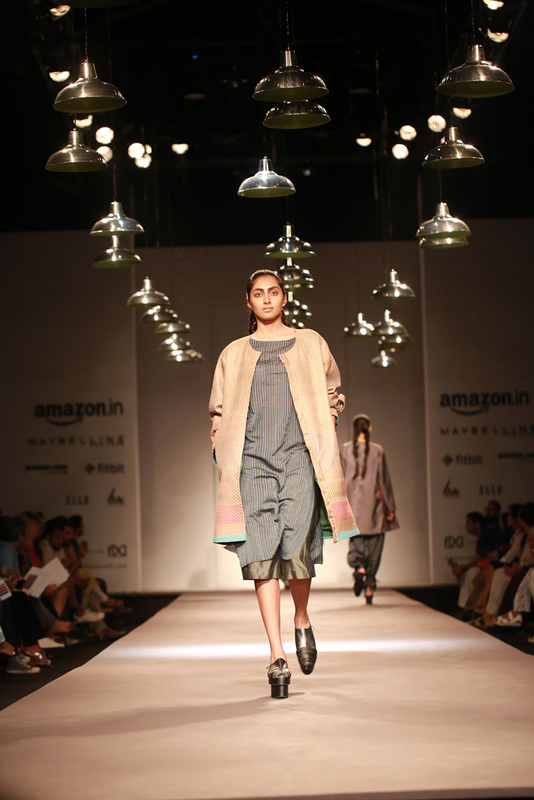 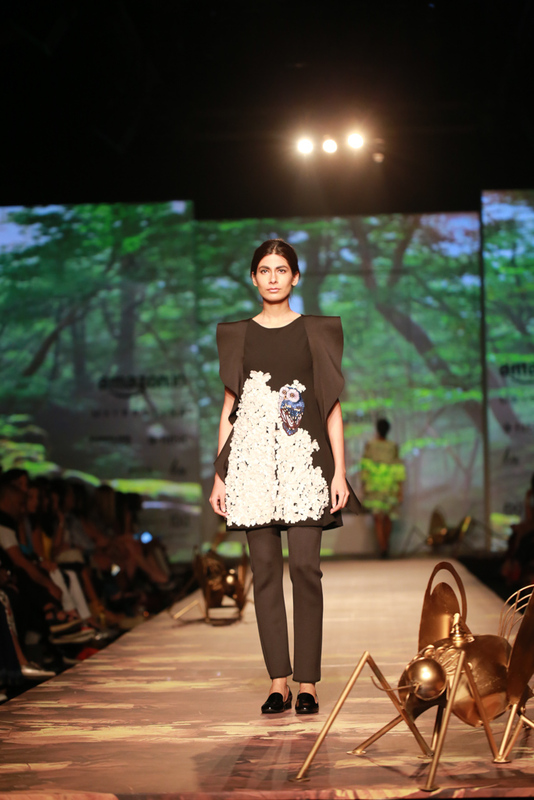 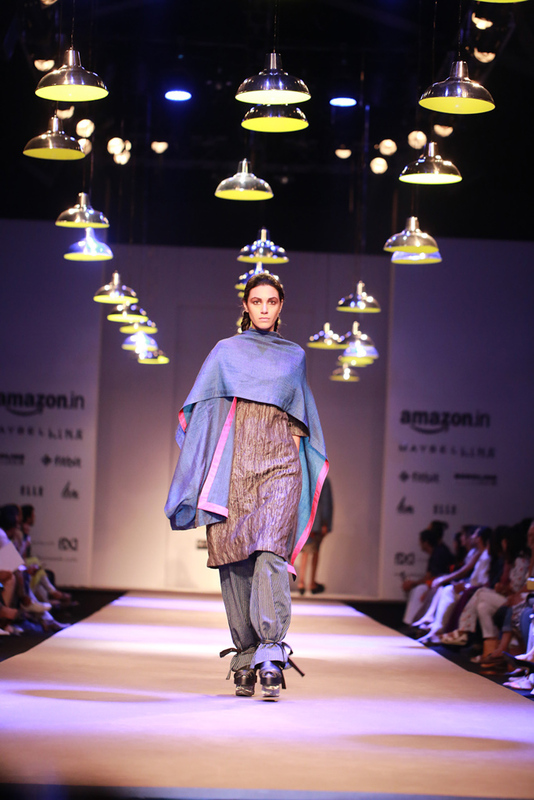 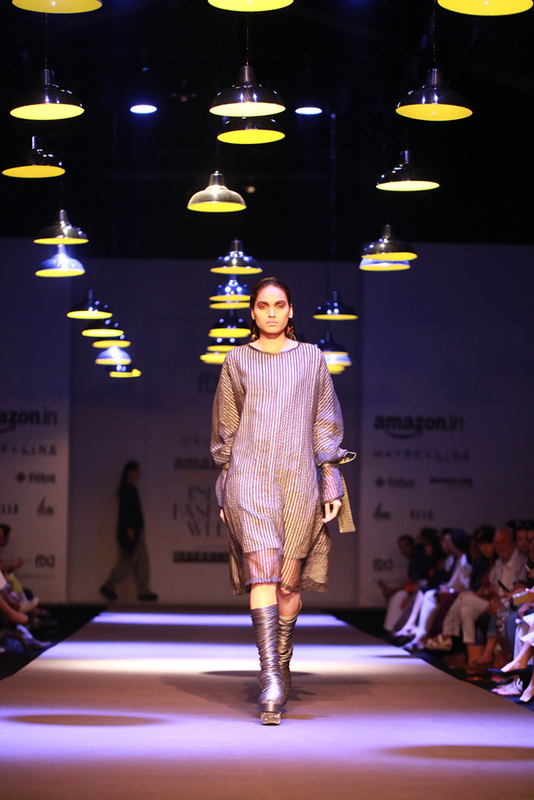 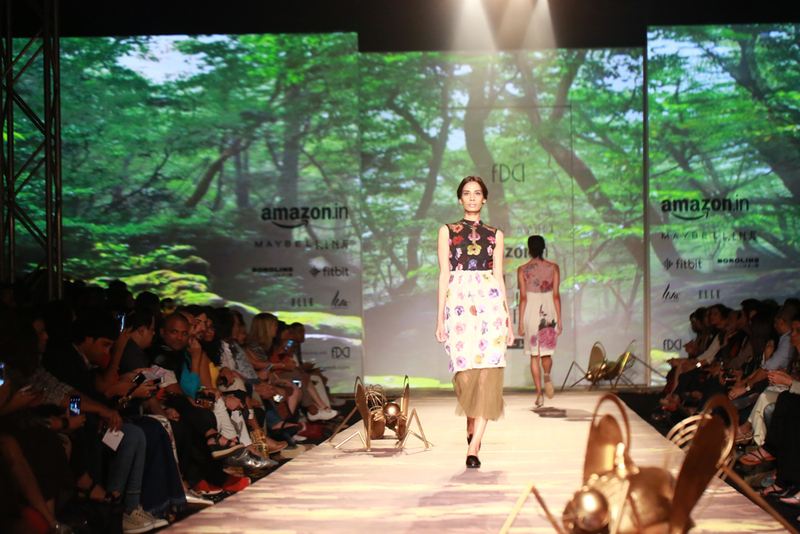 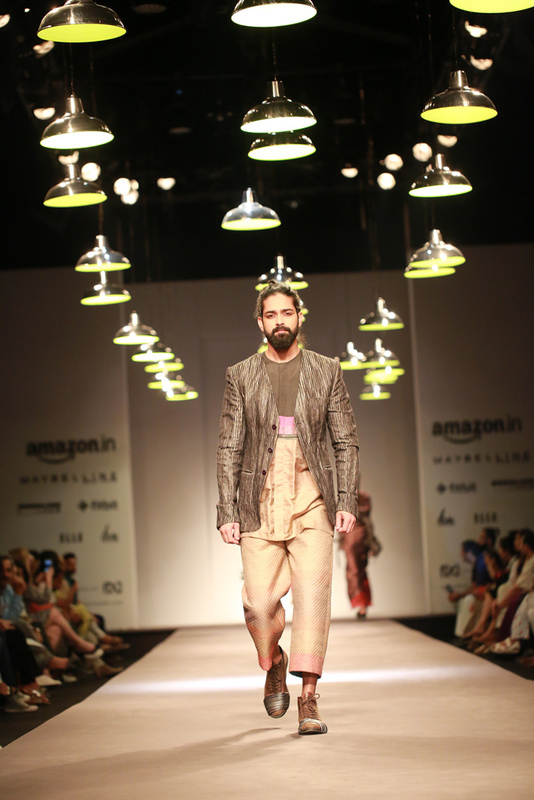 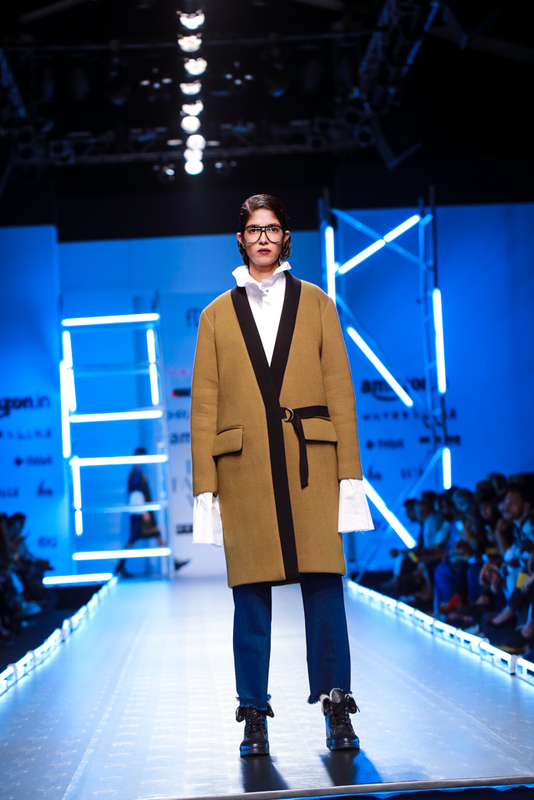 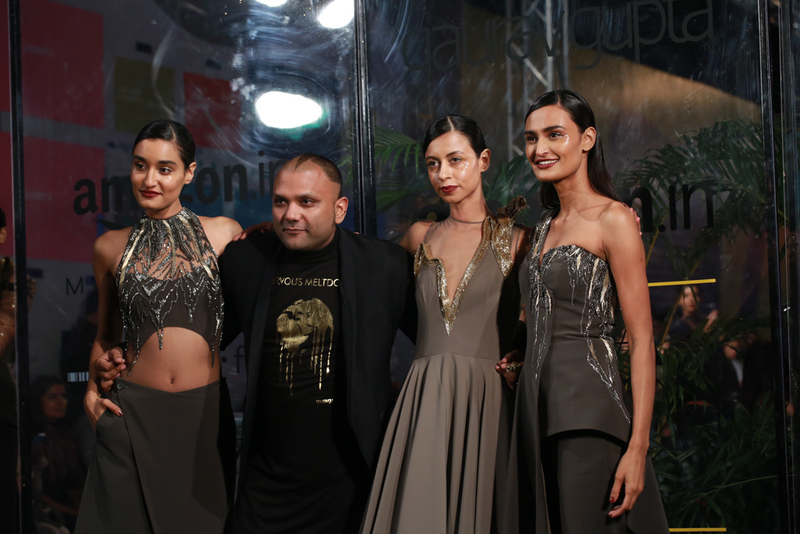 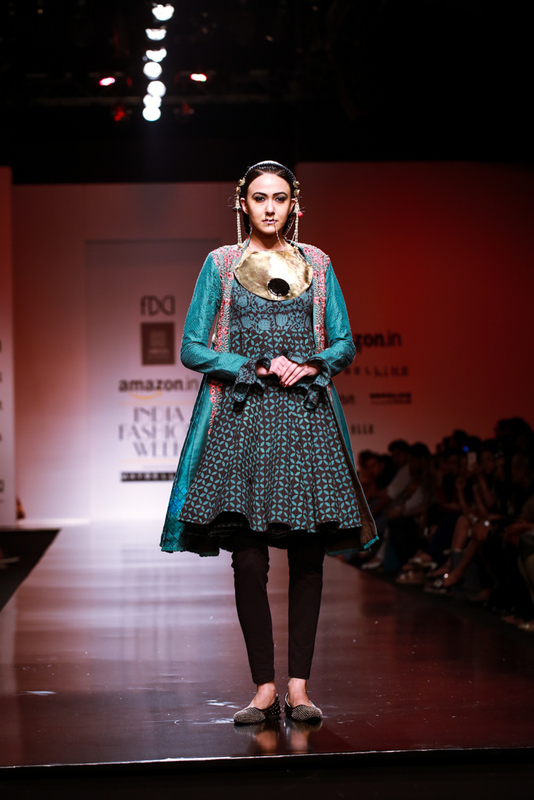 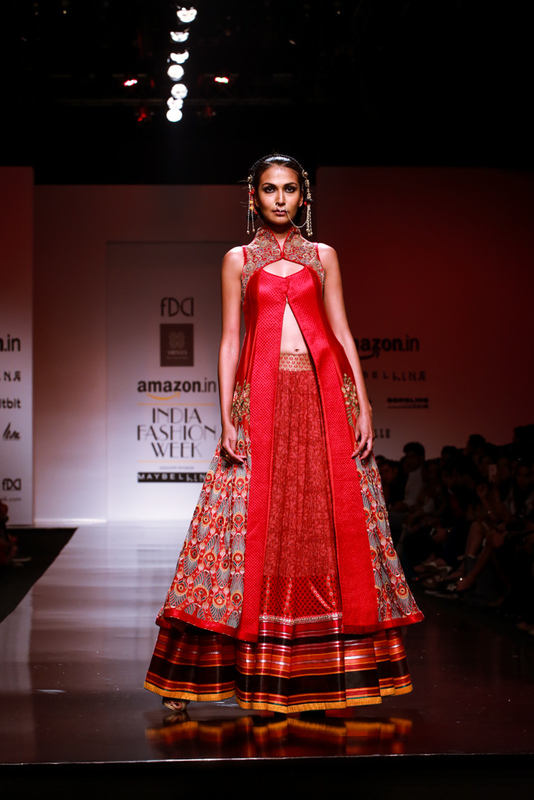 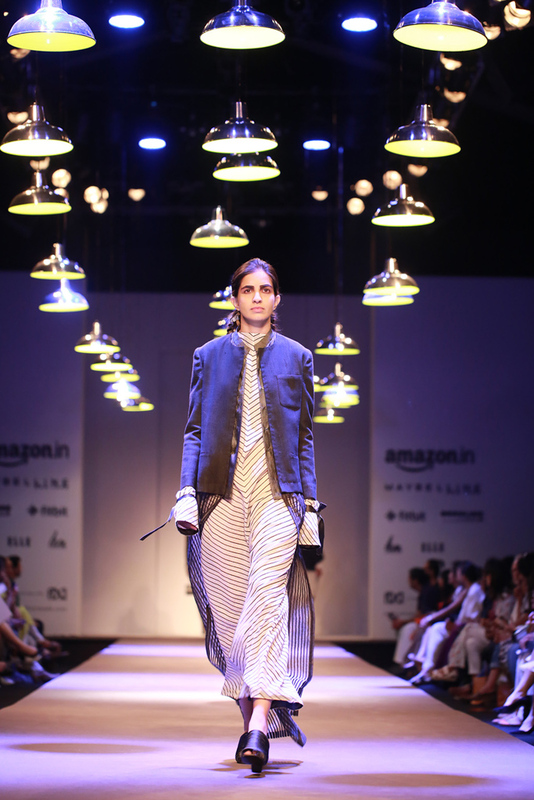 Amazon India Fashion Week. 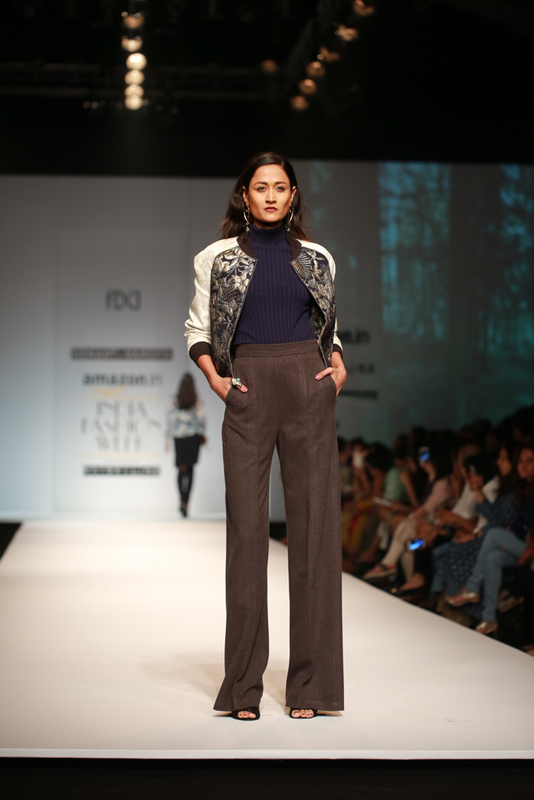 AW16 ~ Day 1 & 2 - BREVILOQUENT. 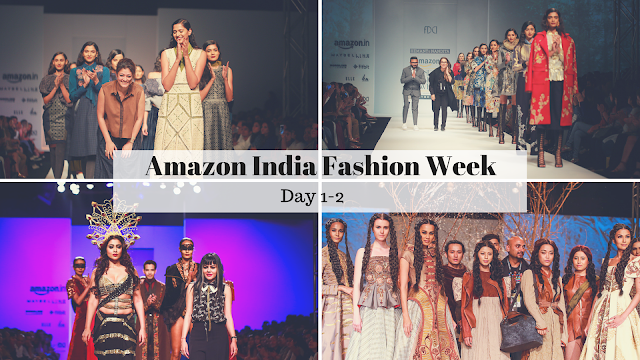 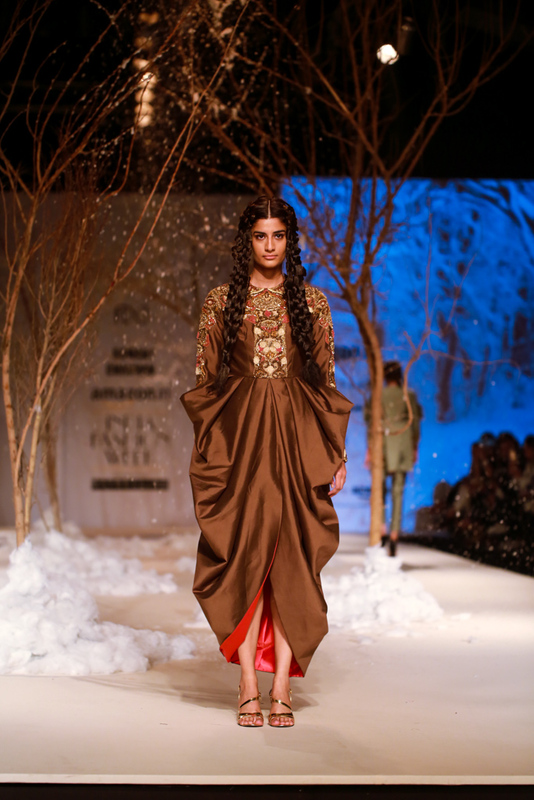 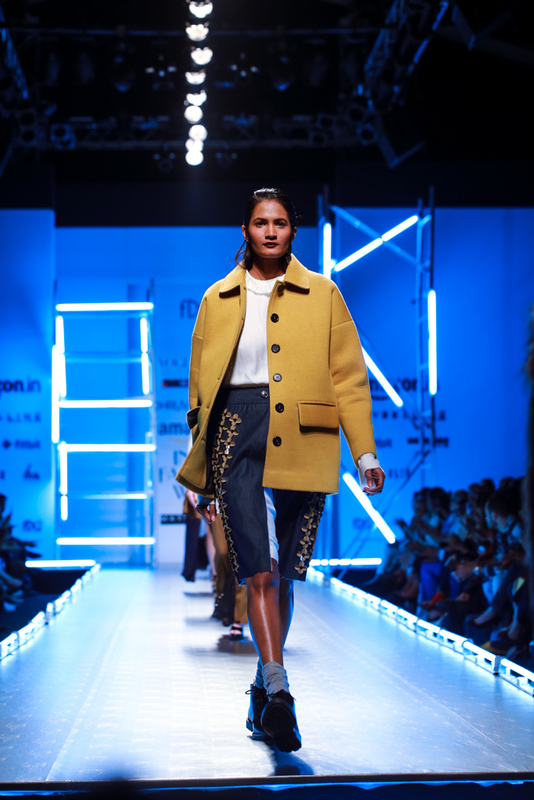 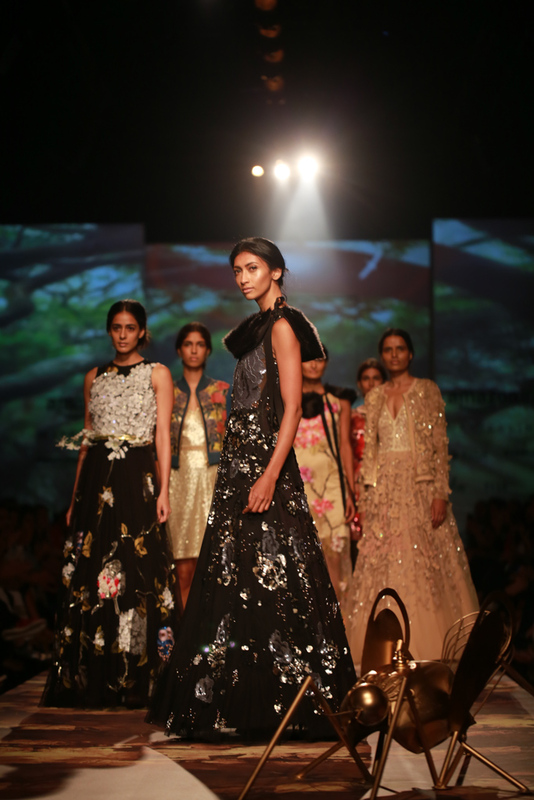 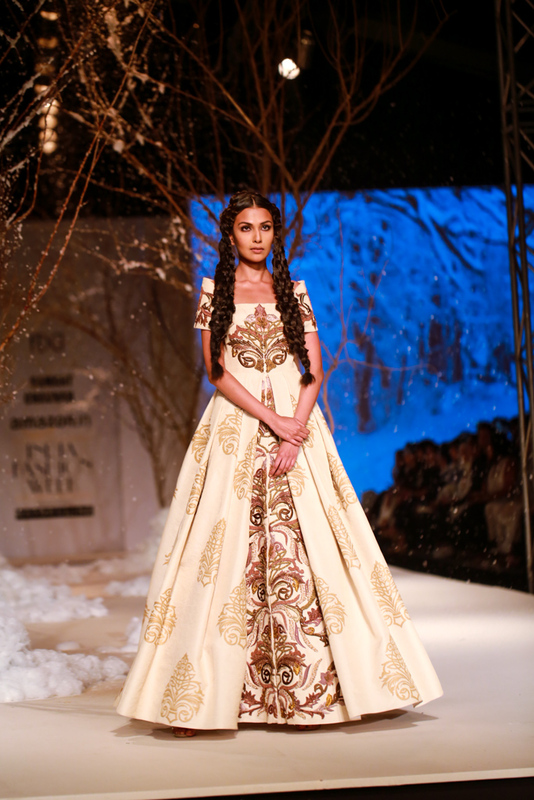 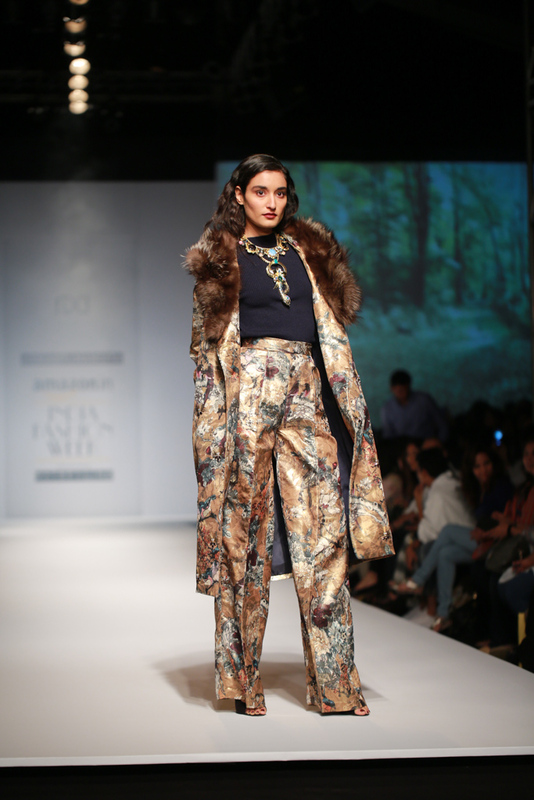 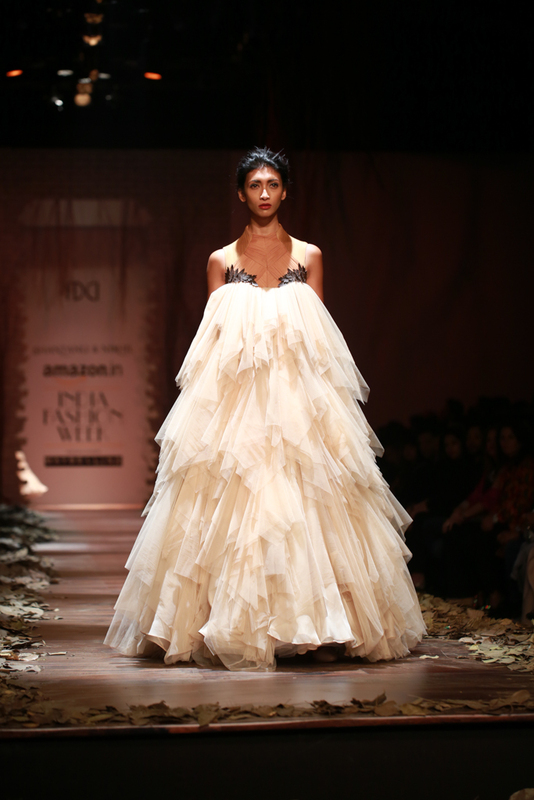 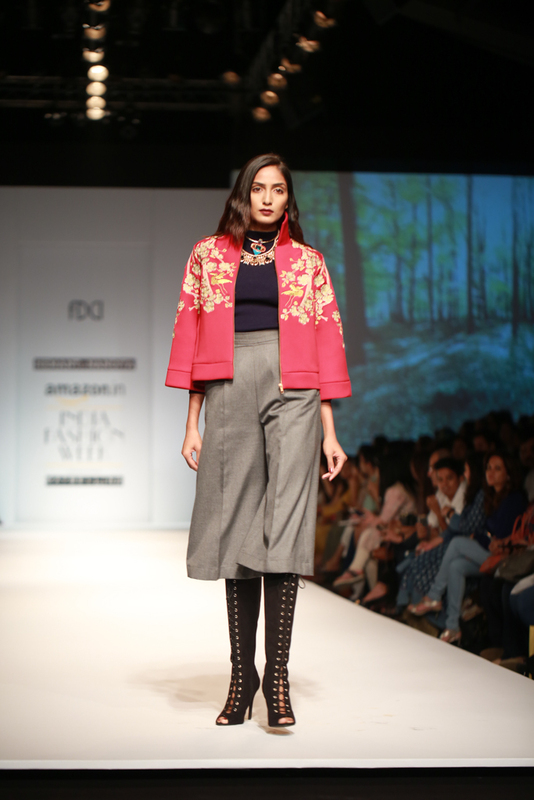 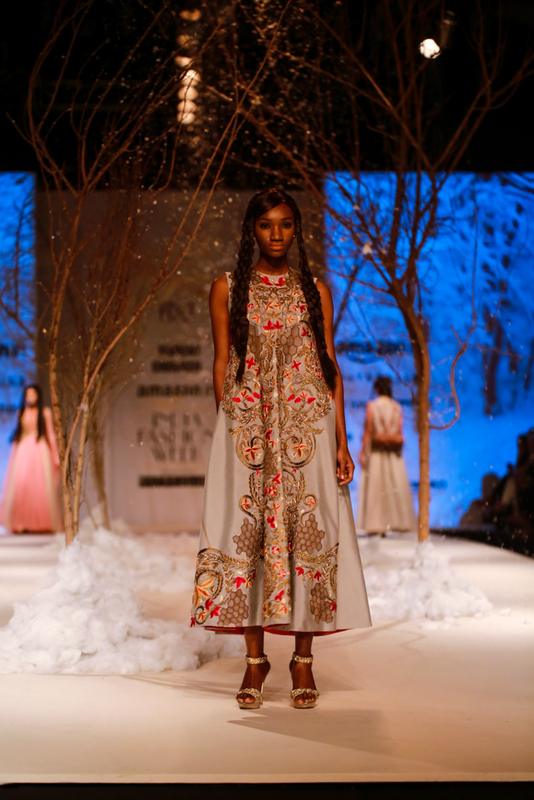 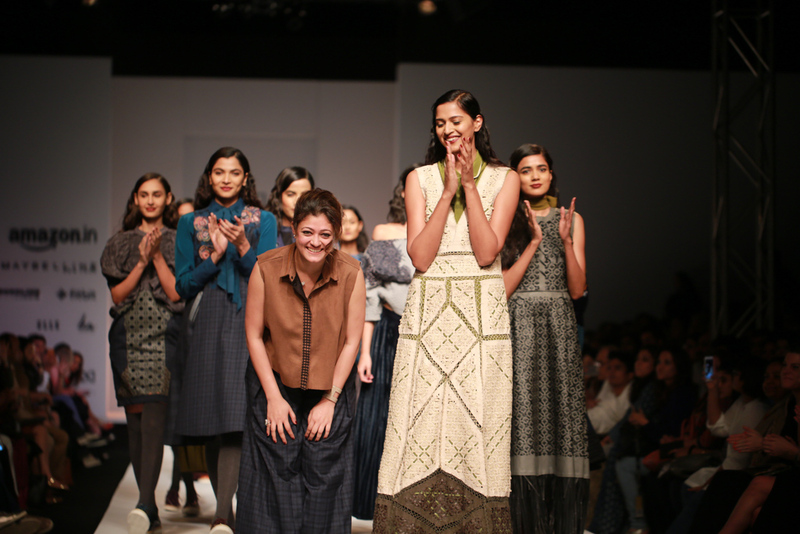 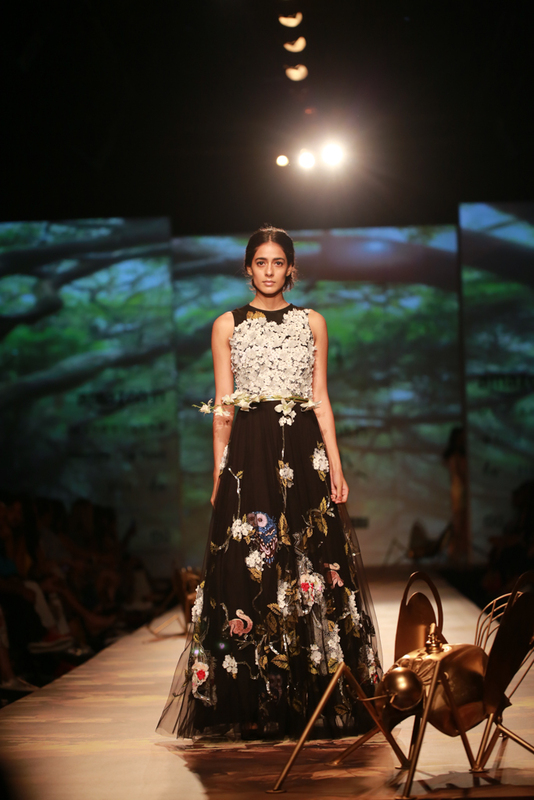 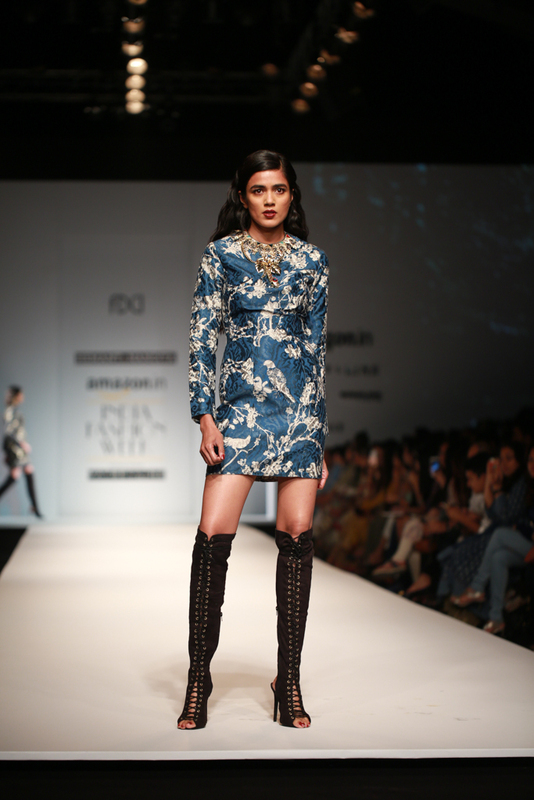 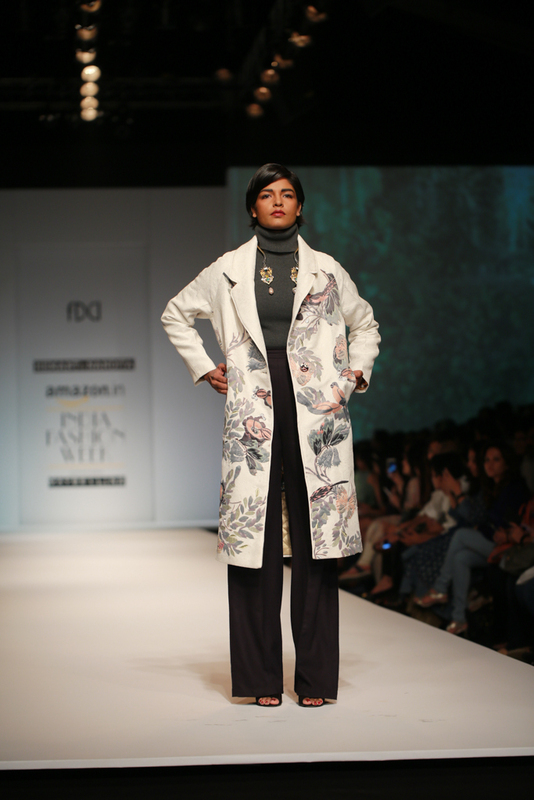 Day 1 Of AIFWAW16 held this year at JLN studio started with a Varun Bahl show that ended with a grand Gaurav Gupta show. 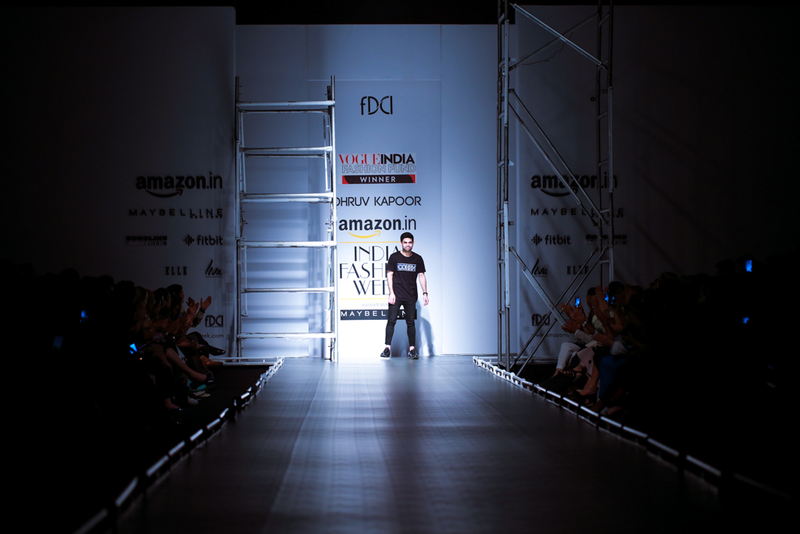 What happened in between is all documented for you in a photo diary to bring you the runway trends for this season. 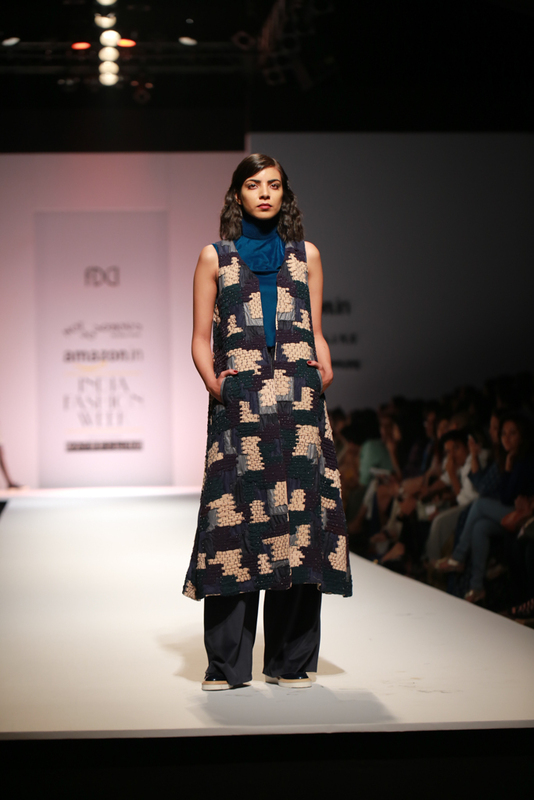 Handwoven reversible fabrics developed in fine blends of merino wool, monofilament silks, cotton, zari and stainless steel. 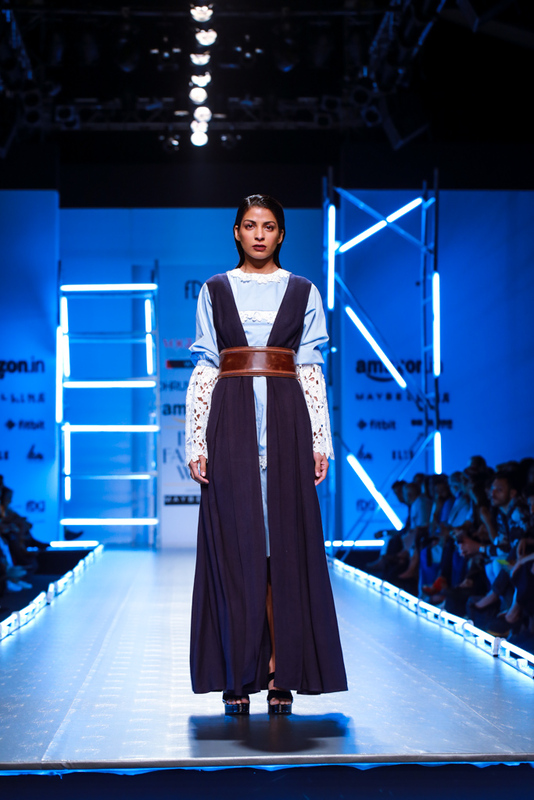 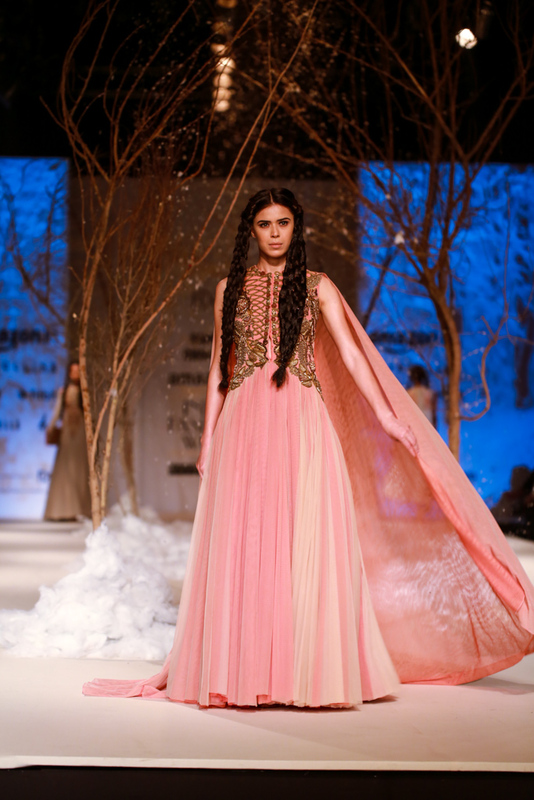 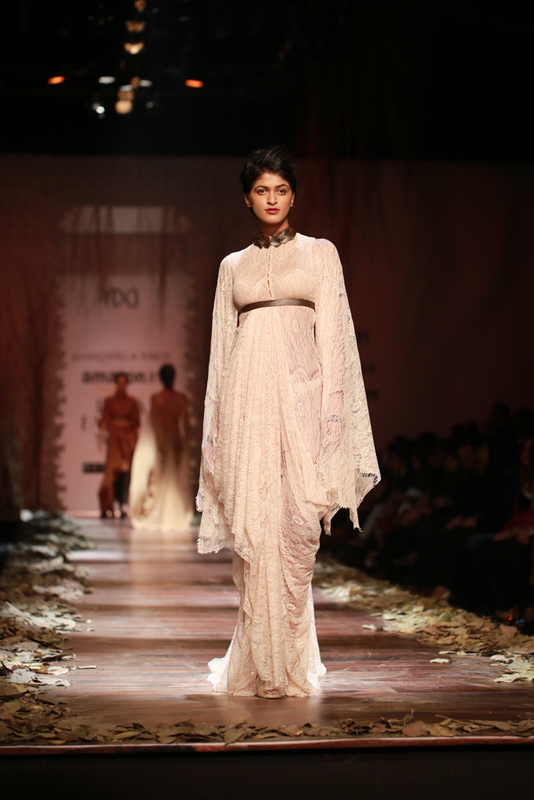 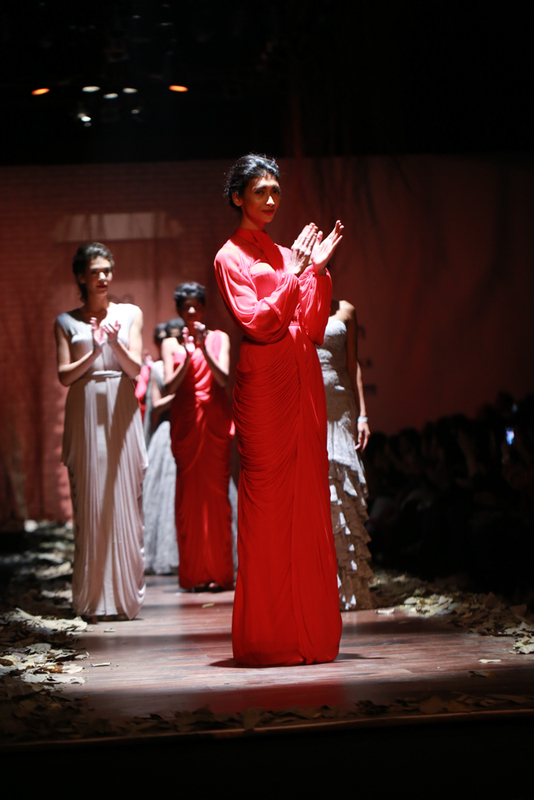 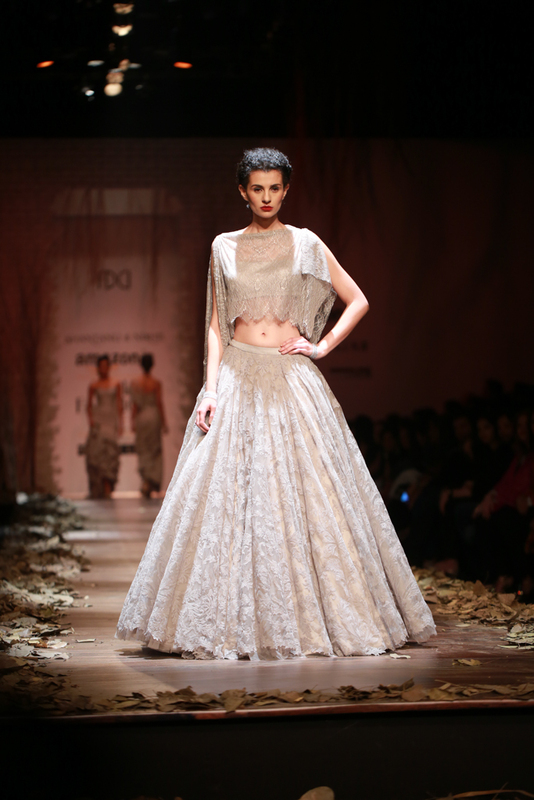 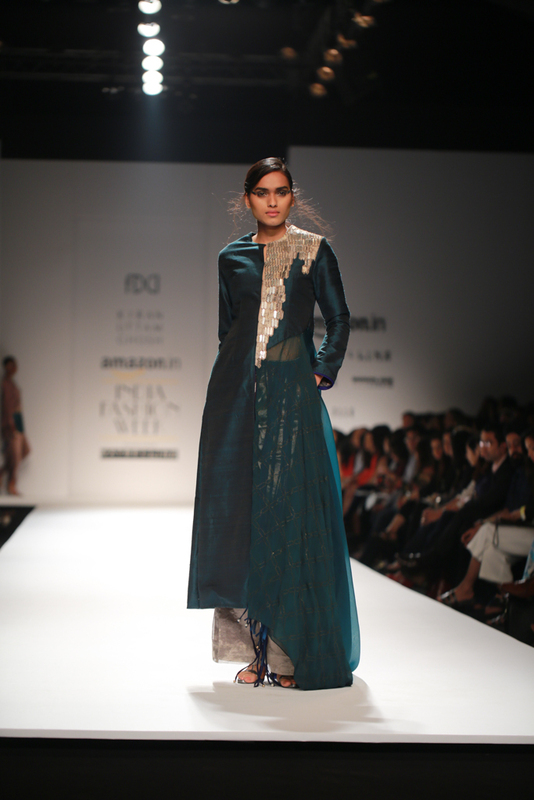 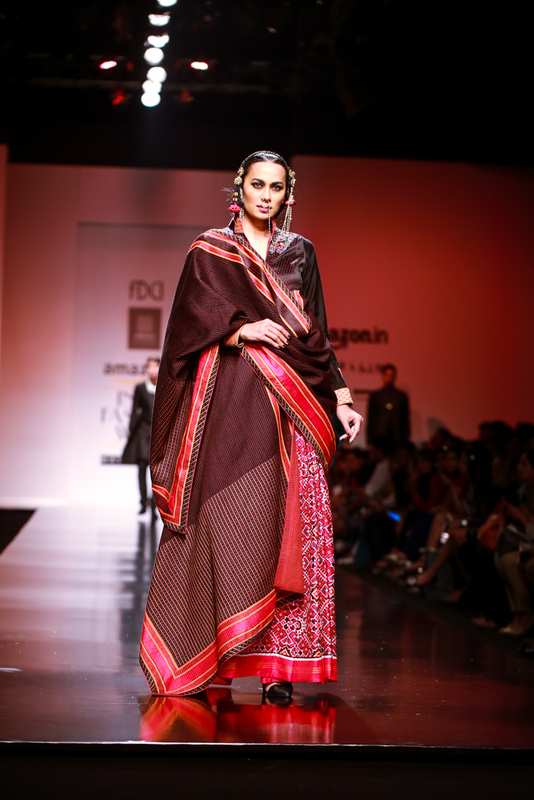 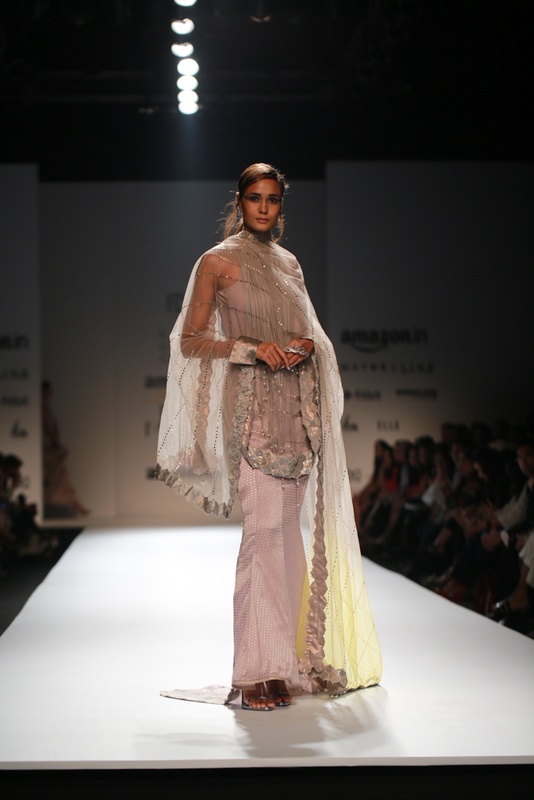 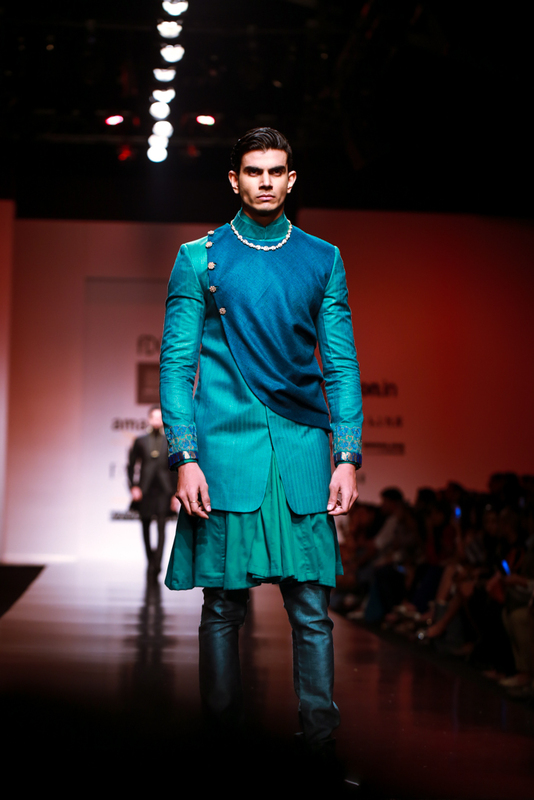 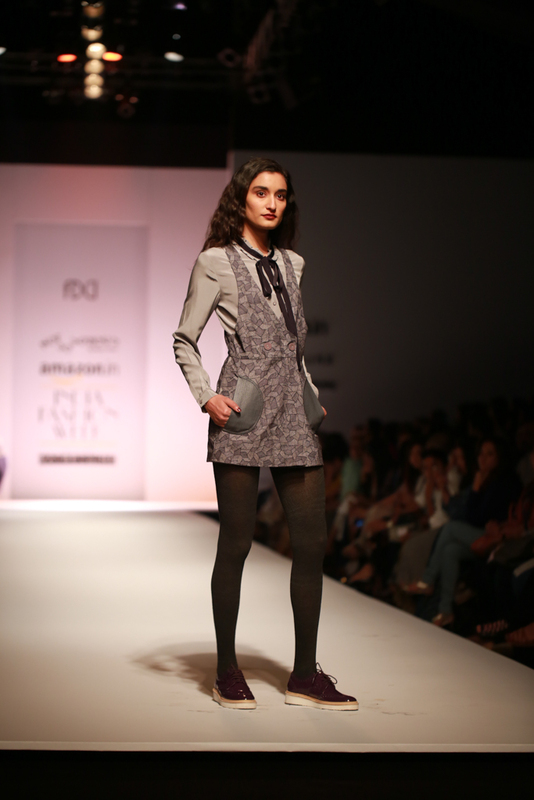 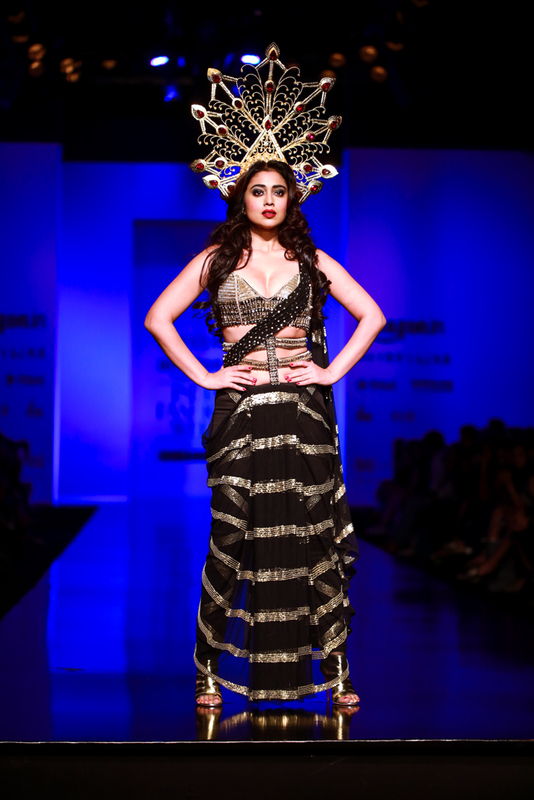 Gaurav Jai Guptas collection consisted of separates for women and men along with sarees reconciling the contradictions. 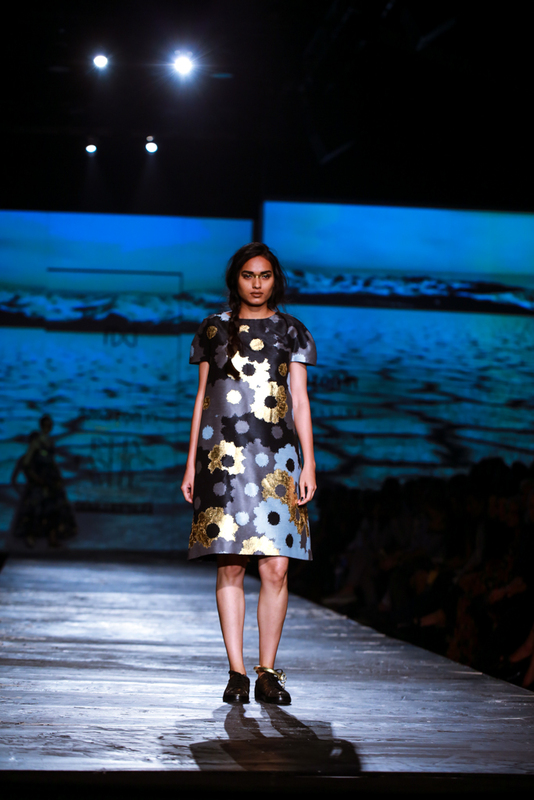 Synthesis is the evolution of hand crafted techniques that have become the hallmark of the brand. 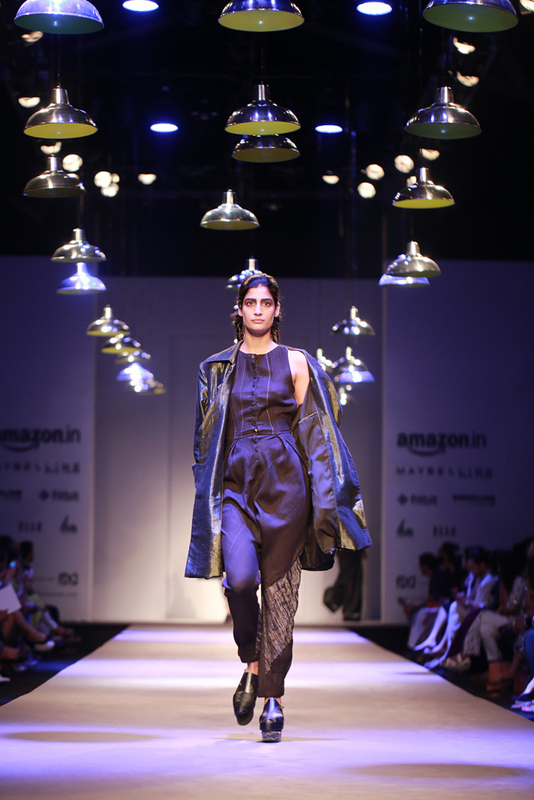 Taking ideas from the past to the zenith and binging them together in a powerful yet cohesive way. 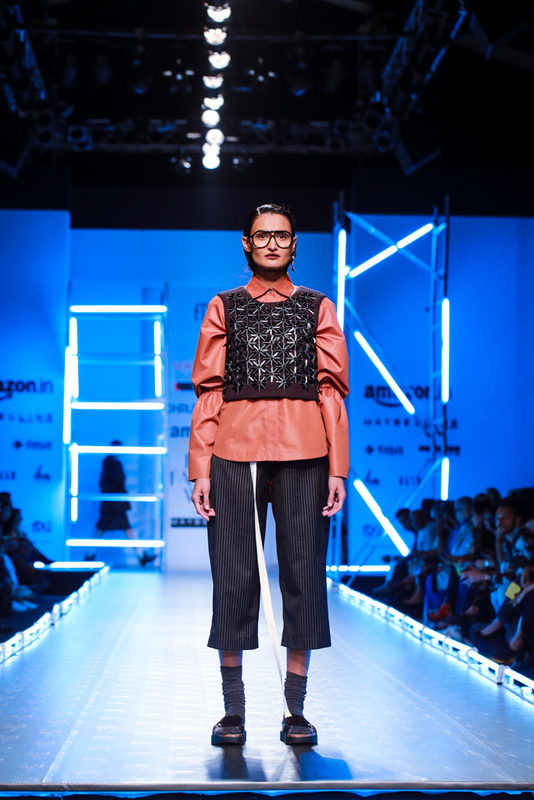 With dimensional layering techniques further enhanced using precision laser cut leathers, interwoven stripes in contrast that create depth, 'synthesis' is a small manifestation of that philosophy. 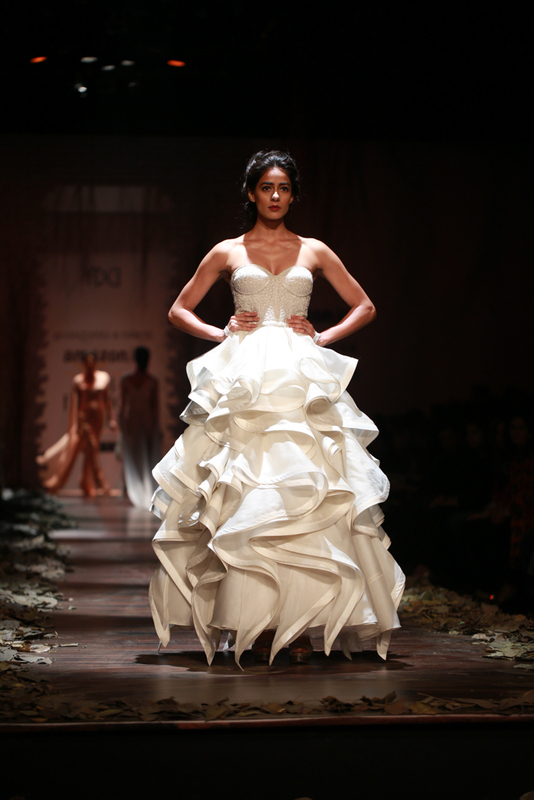 Organic and spectral effects are created by a kaleidoscope of organza elements and shingled panels. 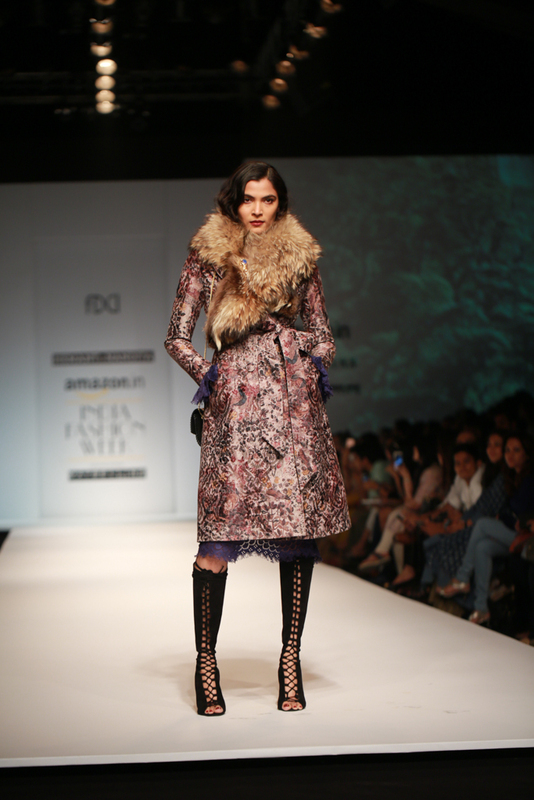 Intricate hand details based on sea anemone inspired motifs and succulent florals. 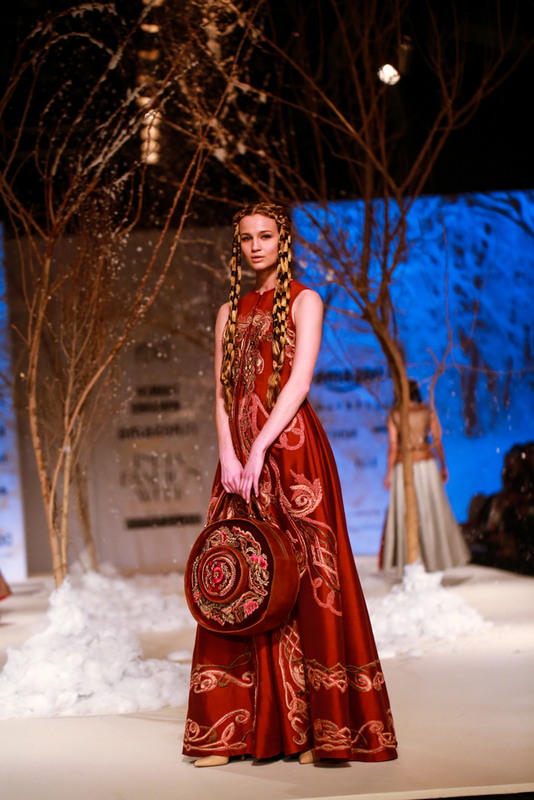 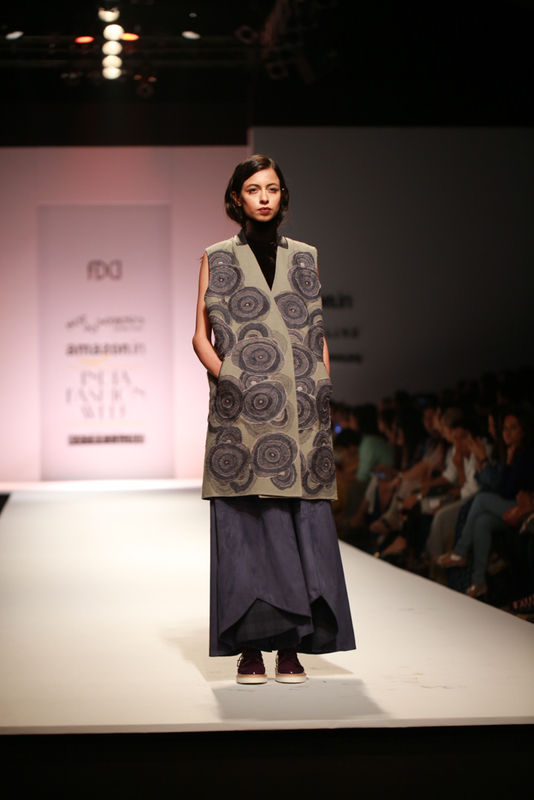 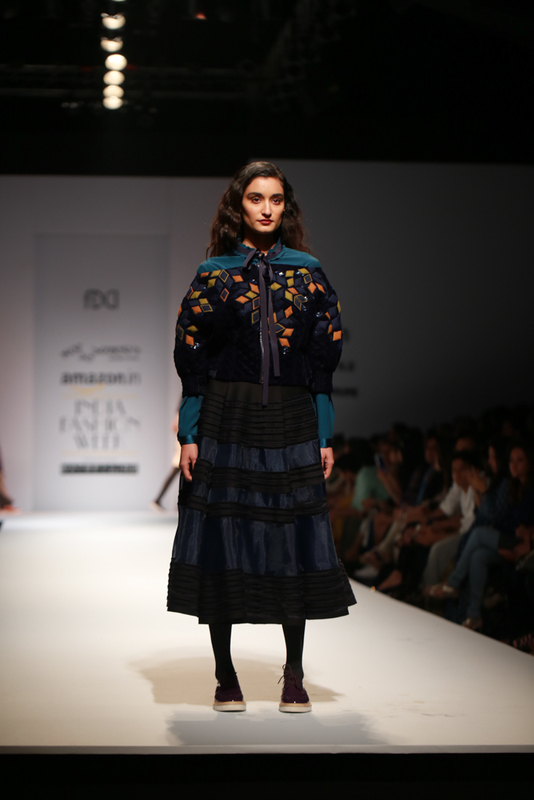 Fabric manipulation and three dimensional forms give life to this collection. 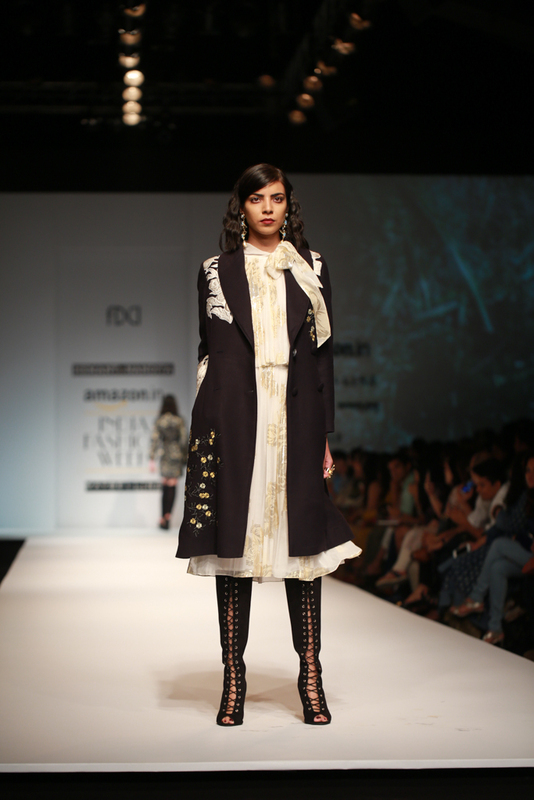 The inspiration for embroideries, textile selection and placements for Ghosh's "silver" comes from the textures from jewellery. 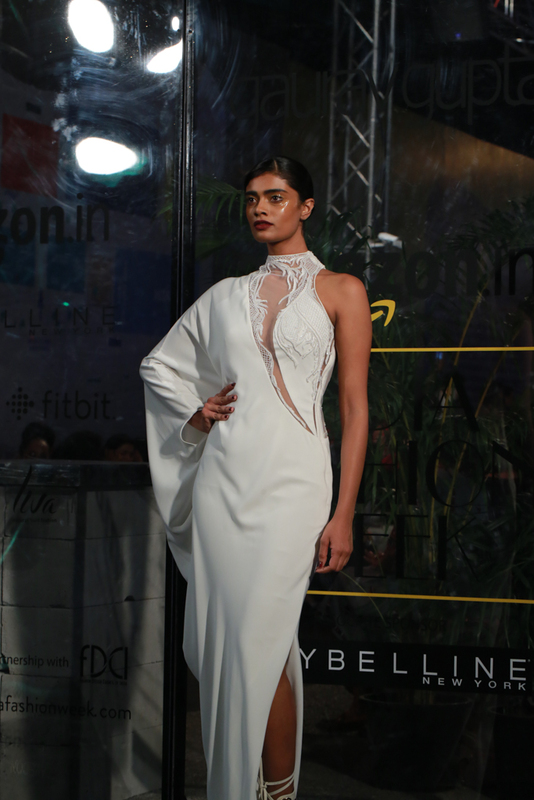 Silver fiiligree work with inserts of pearls and small crystals, beaten silver cuffs, collars, hemlines, chunky chokers, ear cuffs palm bracelets, this collection is a celebraton of excess and maximalism all the way. 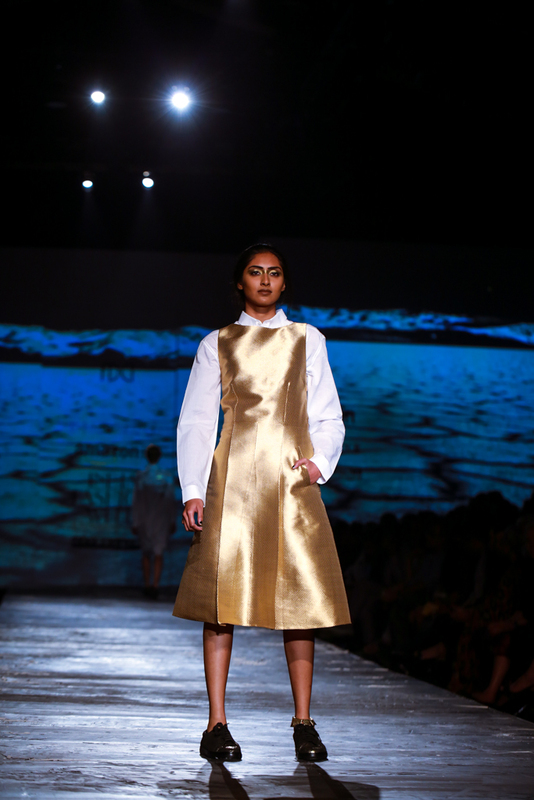 Climate change is a long living reality for all on our planet, Parts of the world as we know it are either going to freeze or melt, "Melt" by Gupta, is a line inspired by this thought, a feeling of melancholic apocalypse. 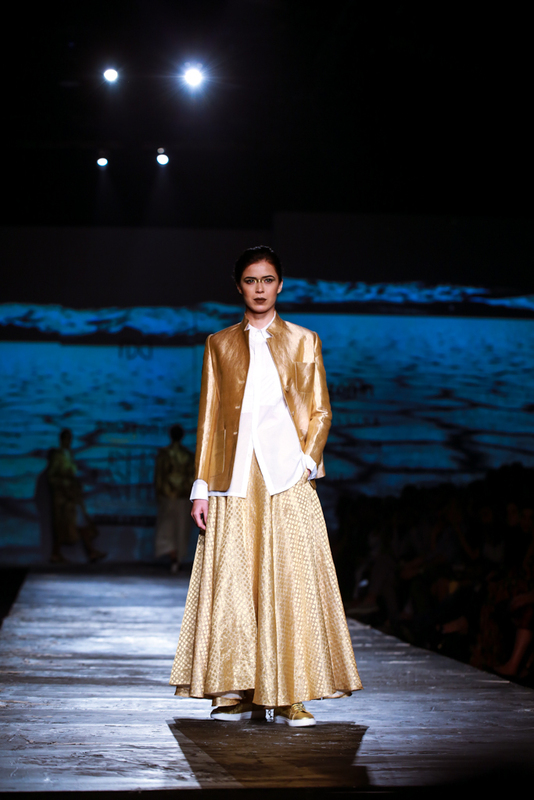 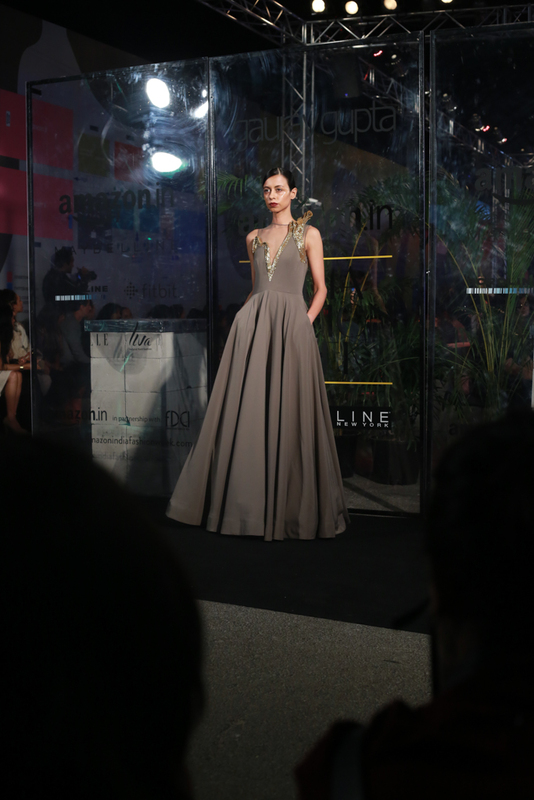 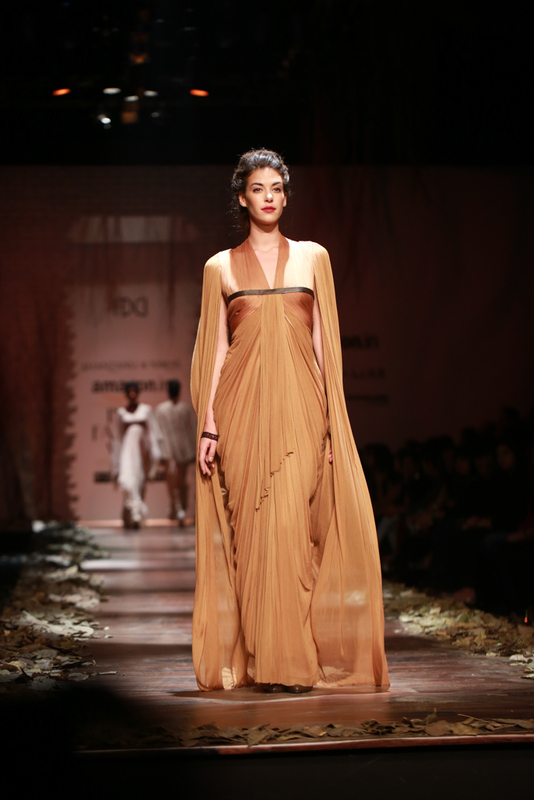 Most of the collection is a zero waste and has draped the entire width of the fabric in a given garment. 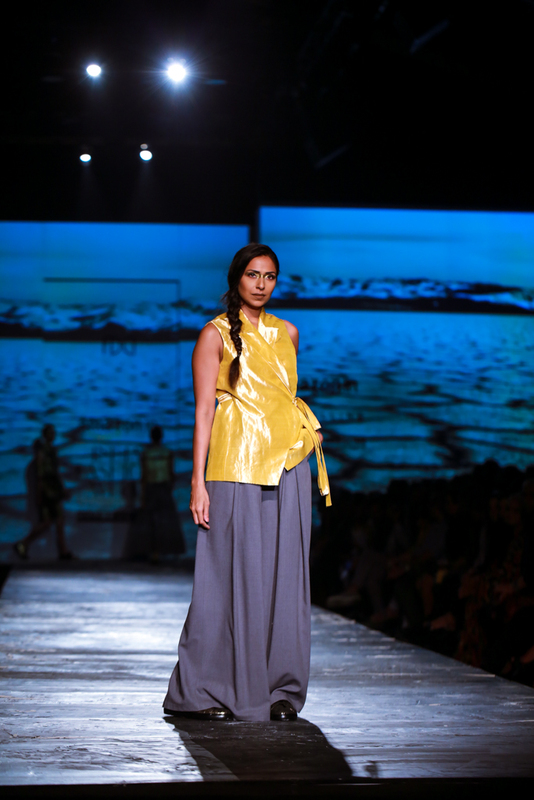 Melt is deep in its colors of fire - from a flaming orange to a dark blazing blue, the absolute black in a coal deep fire and the shades of ashes in gray. 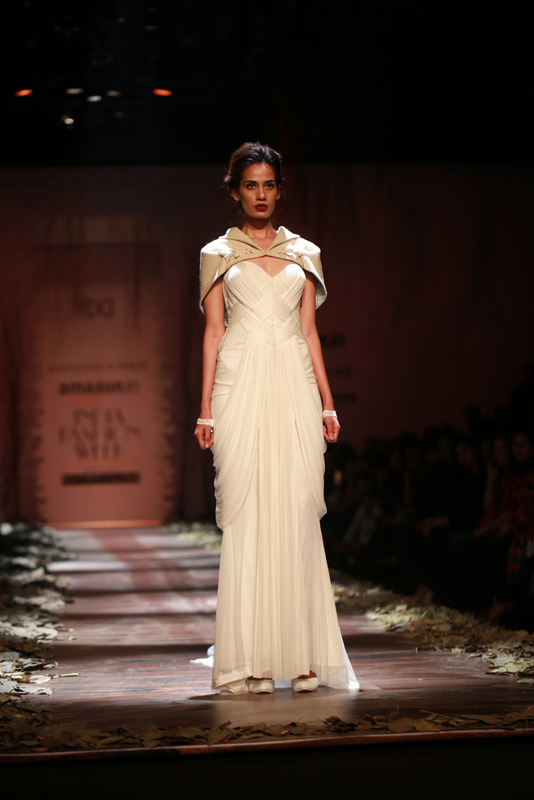 to the absolute white ash. 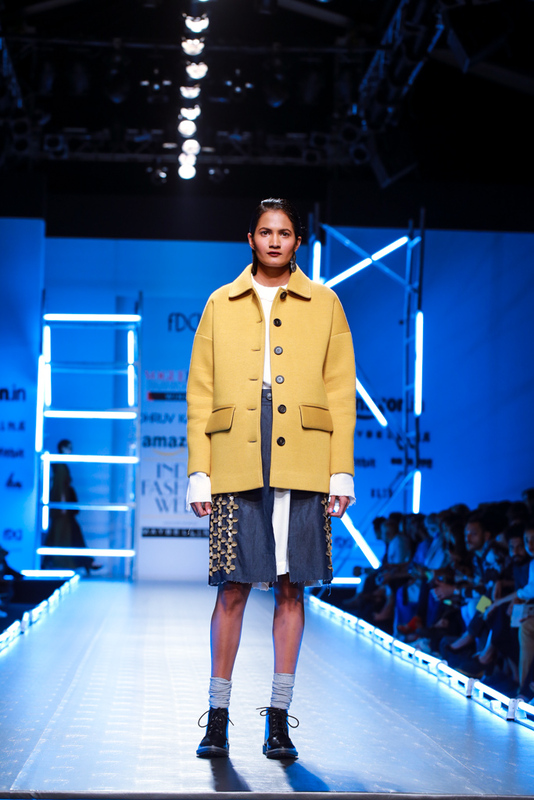 Fabrics have structured fluid suitings, neoprene, sparkling jersery and silks form long molten gowns, bouncing asymmetry jackets and frockcoats. 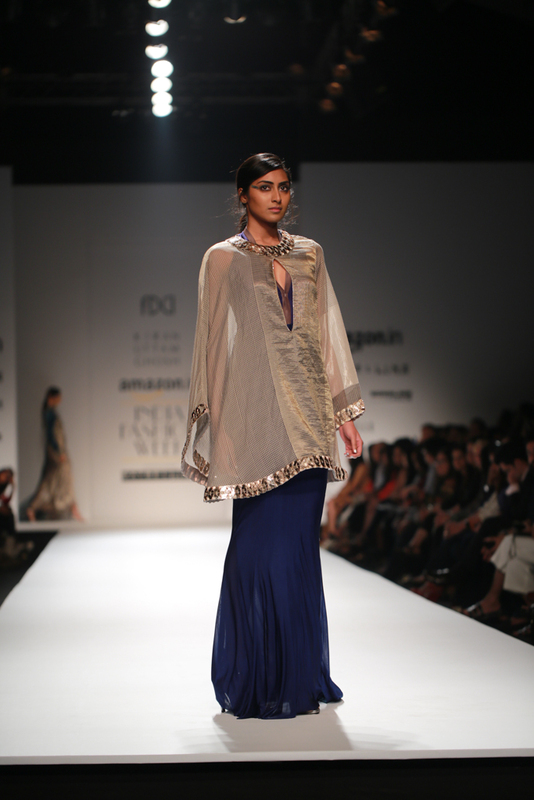 Tonal intricacies give elements affects and golden sculpting melt down. 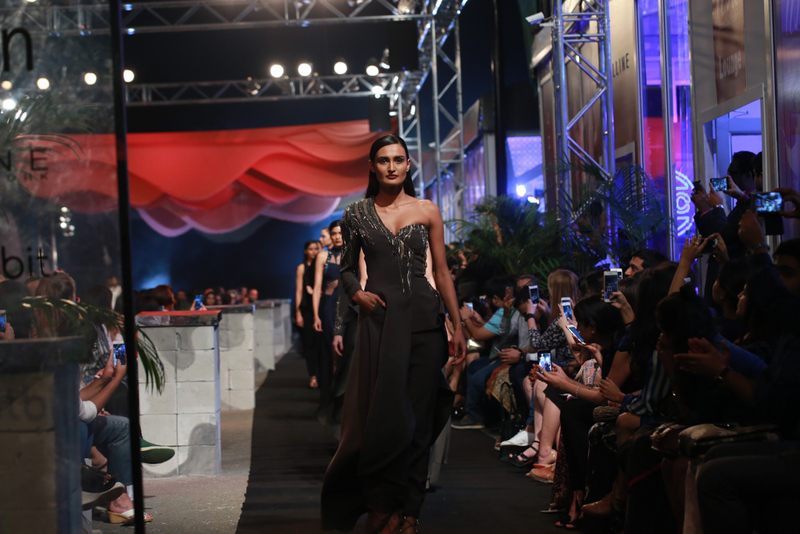 The collection is unabashedly evening or actually more dark midnight. 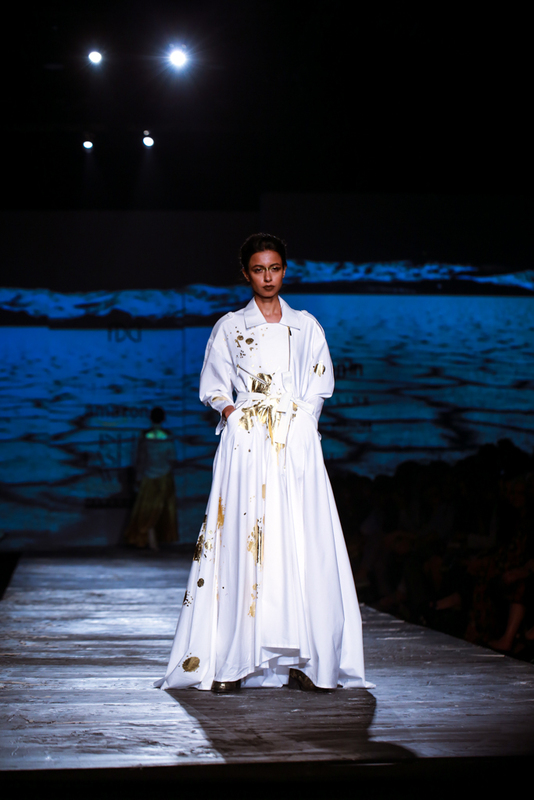 * All images on this post are the property of the photographer and the blog owner. 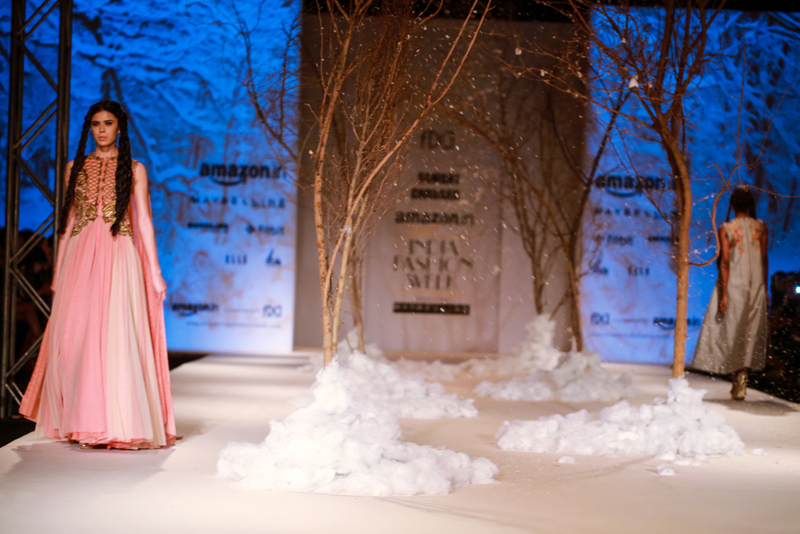 No use what so ever without due credits shall be entertained.